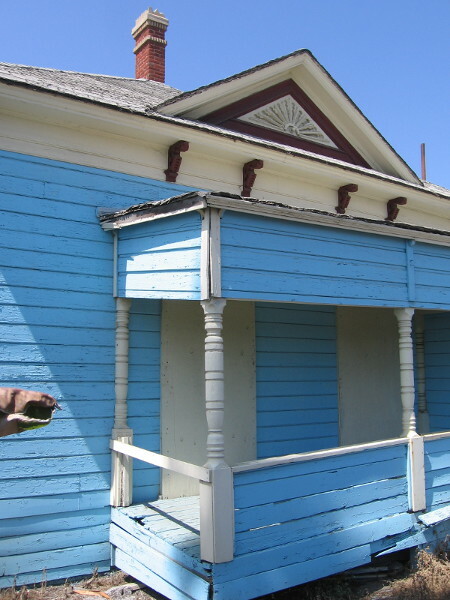 historic homes – Cool San Diego Sights! 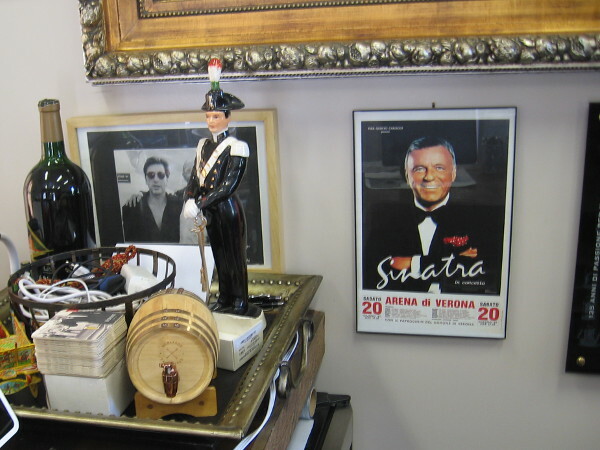 Little Italy’s history, culture at Amici House. 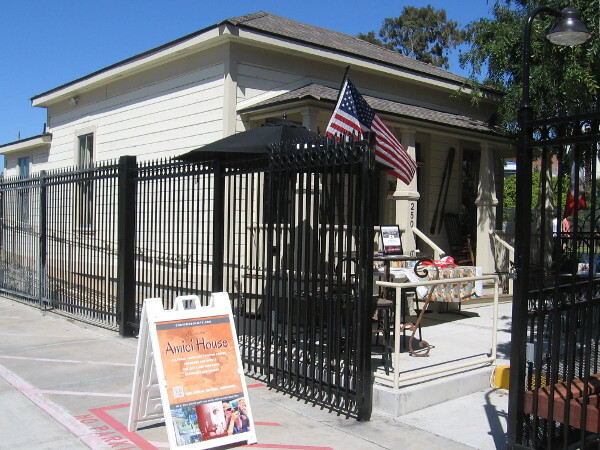 Approaching the historic Amici House, a cultural center in San Diego’s downtown Little Italy neighborhood. In downtown San Diego’s beautiful Little Italy neighborhood, tucked among trees between Amici Park and the popular Little Italy Dog Park, one can find a small house that is named for friendship. It’s called Amici House. 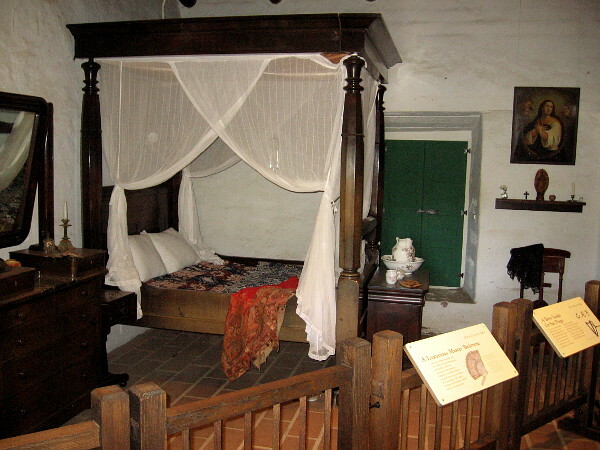 A century ago the Amici House was home to the Giacalone family, who lived in Sicily before their arrival in San Diego in 1916. 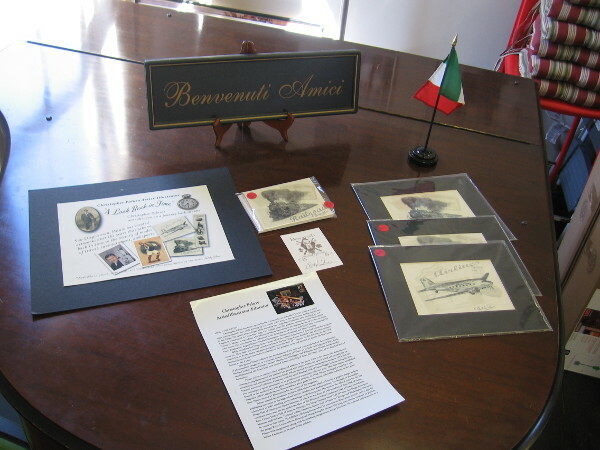 Antonio Giacalone and his wife, Josephine, became an integral part of the local Italian fishing community. Their modest Craftsman style house was originally located a few blocks to the west, near India Street. Last year the structure was moved to its present location at 250 W. Date Street, in order to make room for the new Piazza della Famiglia. 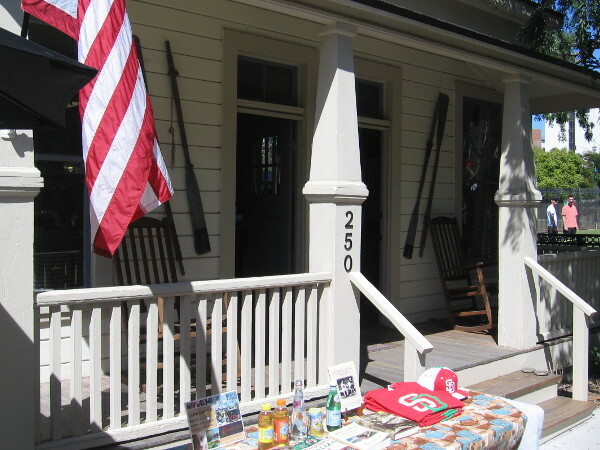 The historic home, now called the Amici House, has become a gathering place for the present-day community. Sheltered by graceful trees, its shady patio is the perfect place to relax, have a drink and chat with friends. 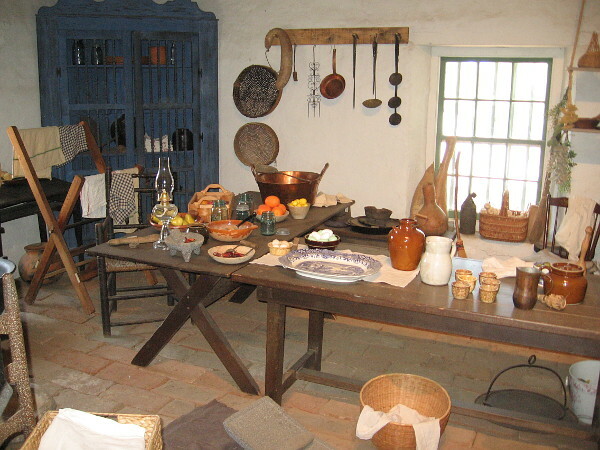 Inside the house one can observe museum-like displays and learn about life in Little Italy, which was home to many immigrant fishermen back when San Diego was considered the tuna fishing capital of the world. 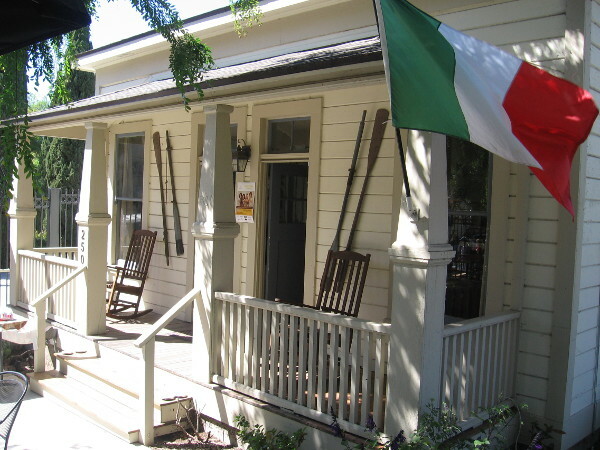 The Amici House is operated by The Convivio Society for Italian Humanities, a nonprofit organization that promotes Italian arts, culture and heritage in San Diego. 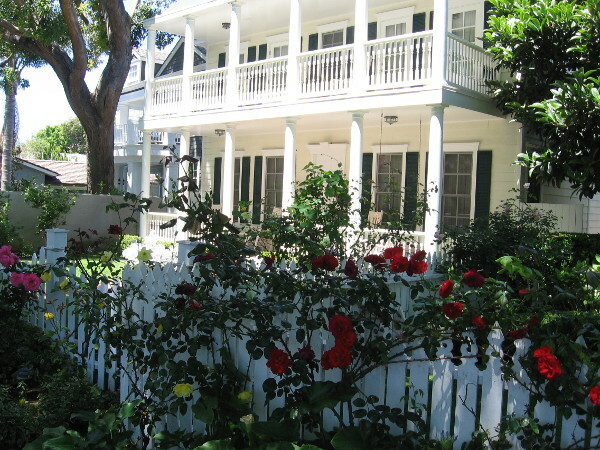 The house with its intimate patio provides a unique venue for concerts and other entertainment. A variety of community activities such as outdoor movie screenings are often enjoyed in nearby Amici Park. 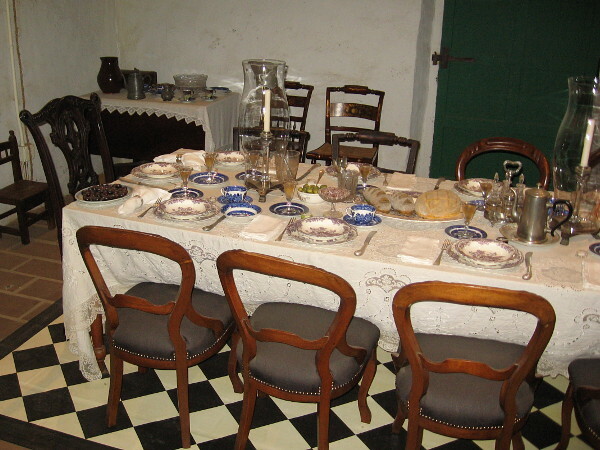 The house can also be rented for private events. I paid a visit on Saturday afternoon and took a few photos. This grassy area in front of Amici House will soon be a venue for outdoor entertainment, with its own small stage. A group of people exits Amici House. I will be able to explore the place during a quiet moment on a Saturday afternoon. Steps lead up into the small, renovated Craftsman style Amici House. 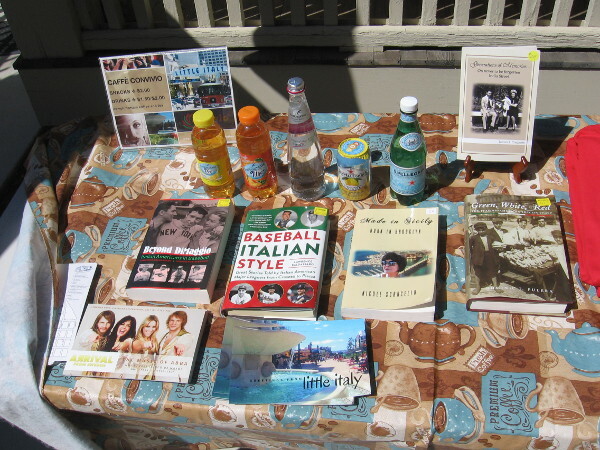 At the bottom of the front steps is a table with books and other gifts. Caffè Convivio offers snacks and a few refreshing things to drink. 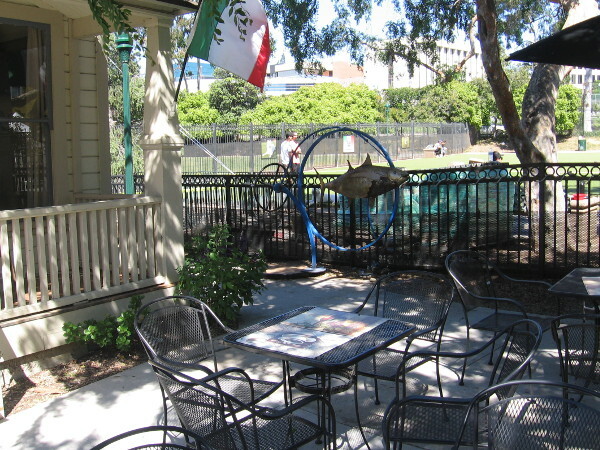 Chairs and tables in front of Amici House provide a pleasant, shady place to relax on a sunny day. 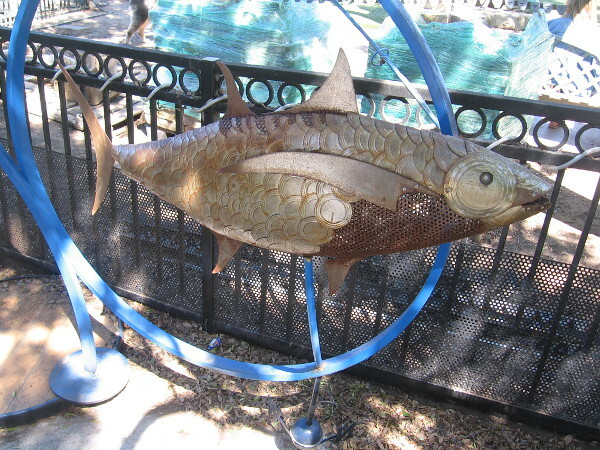 This kinetic fish sculpture is popular with kids. 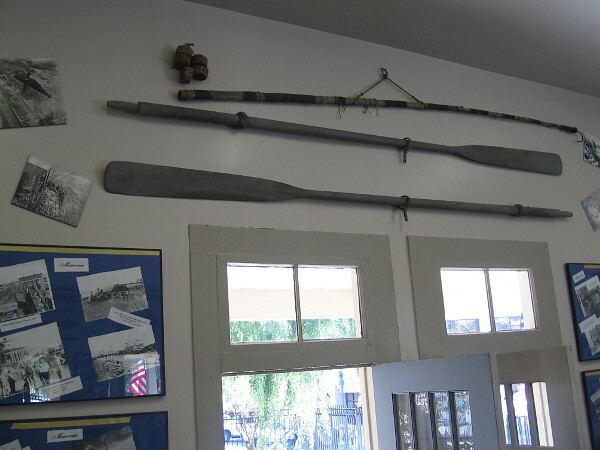 After stepping into the Amici House, I turned around and took a photo of old fishing artifacts above the door. 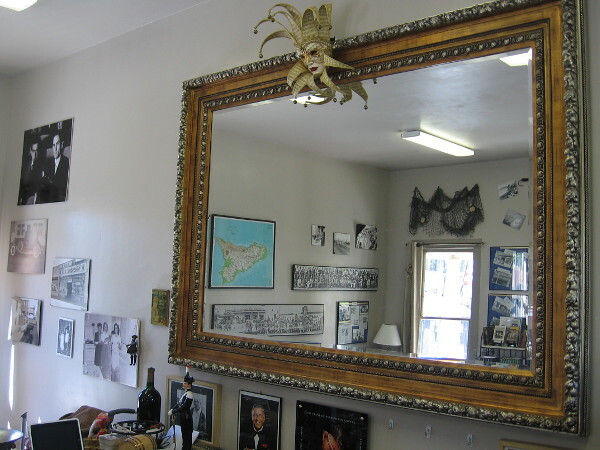 Photo into a large mirror on one wall provides a glimpse of the small museum-like interior. 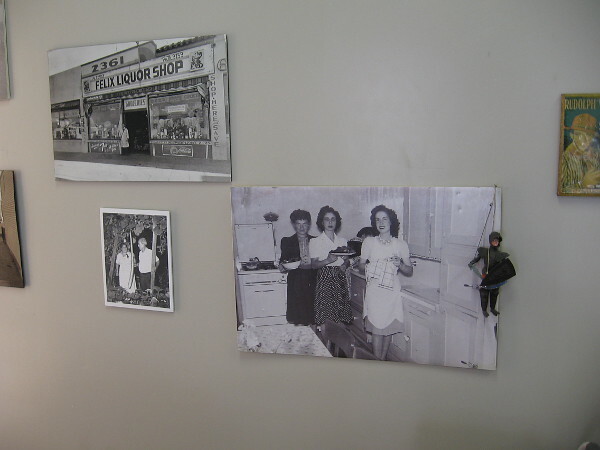 The walls inside the Amici House are full of historical photos and information concerning Little Italy, once center of a thriving tuna fishing industry. Posters, old photos and works of art with an Italian theme appear on all sides. I see Frank Sinatra. 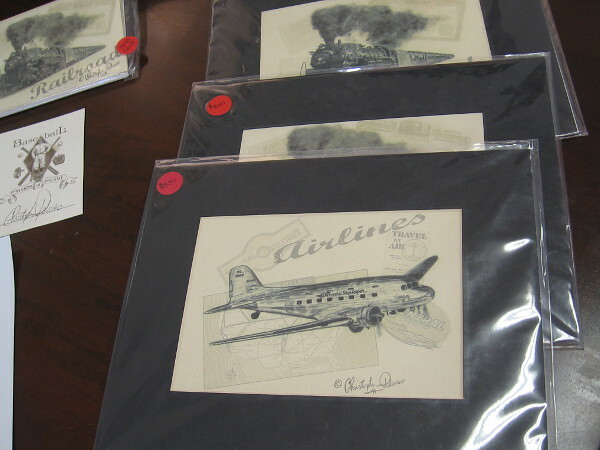 This small exhibition of art features work by sports fan and artist Christopher Paluso. Examples of work by accomplished Italian American artist Christopher Paluso. 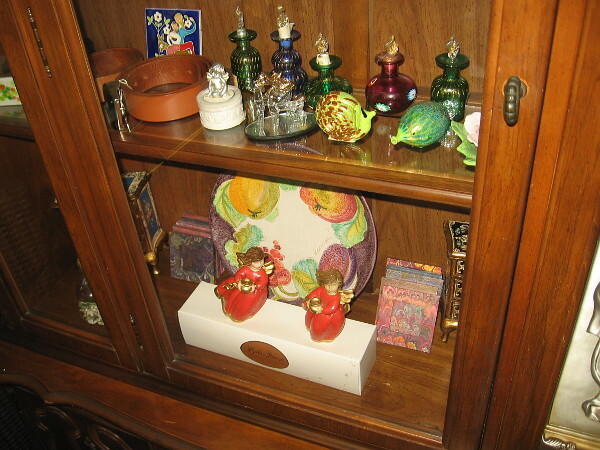 In a wooden cabinet I saw colorful glassware and crafts imported from Italy. 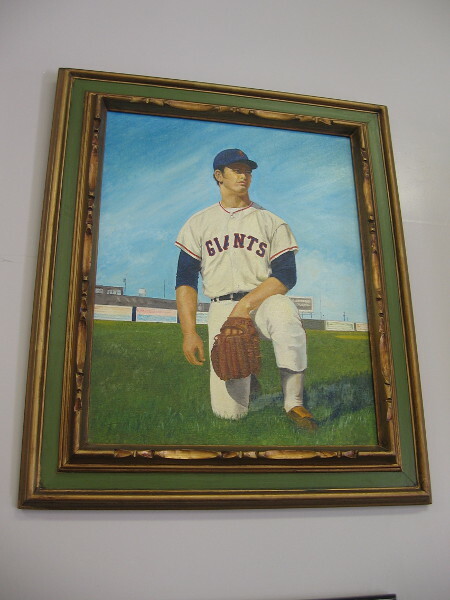 Painting of John D’Acquisto, Italian American baseball pitcher who played four years with the San Diego Padres. 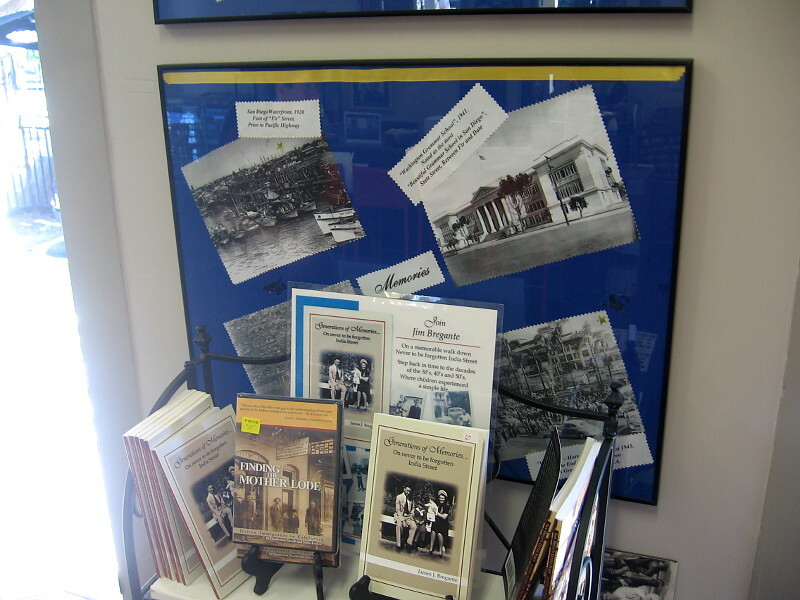 Little Italy has a rich history, including many generations of families that still thrive in the community today. 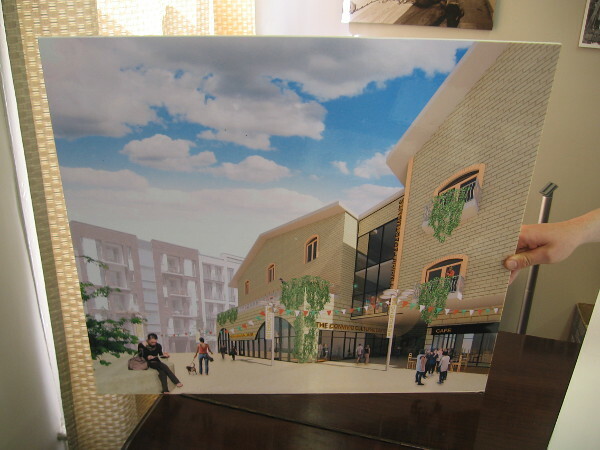 I’m shown a rendering of a proposed, much larger cultural center that might be built by The Convivio Society in the future. Meanwhile, the Amici House holds (and produces) cherished memories for a lively San Diego neighborhood. 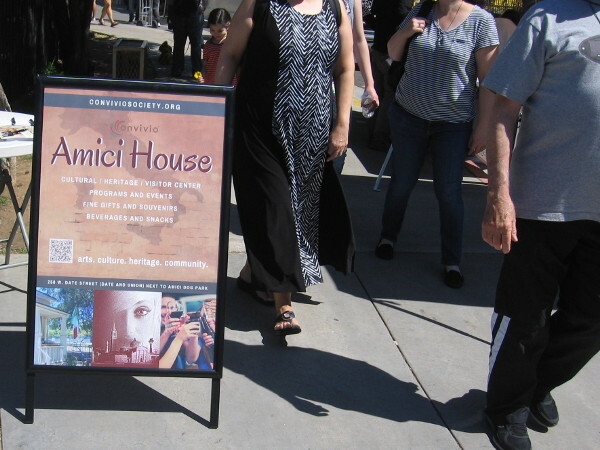 Posted on April 2, 2019 April 2, 2019 Tags architecture, art, community, culture, entertainment, fishing, historic homes, history, houses, italy, little italy, museums, photography, san diego4 Comments on Little Italy’s history, culture at Amici House. Magical light transforms Old Town backyards. After work I got off the trolley at Old Town, crossed Congress Street, and headed into the State Historic Park. With the recent return to Daylight Saving Time, there’s an extra hour of light for a leisurely walk. At first I wasn’t sure what I would photograph. Then, minutes before the sun might disappear behind the horizon, I found myself lingering near the backyards of several very early San Diego houses. It was the golden, almost dreamlike light that caught my eyes. 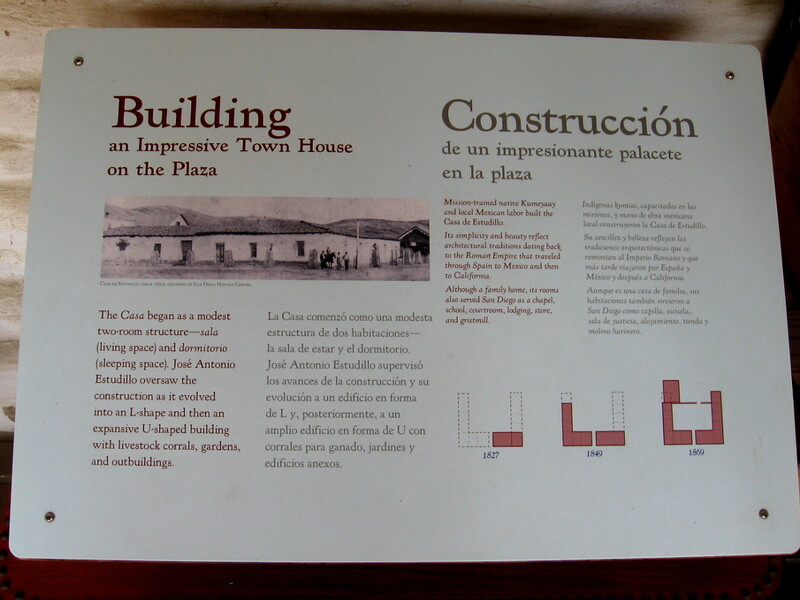 I walked along a quiet pathway that passes behind a row of historic structures, including Colorado House, La Casa de Machado y Silvas, U.S. House and San Diego House. These backyards, back porches and gardens always appear a bit timeworn and scraggly, but the late light magically turned them into something wholly new. 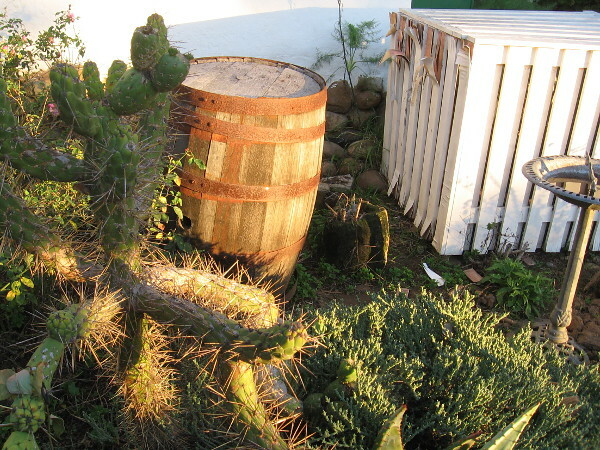 Posted on March 14, 2019 March 14, 2019 Tags buildings, evening, gardening, historic homes, history, light, magic, old town, photography, san diego, state parks, tourism, travel, walkingLeave a comment on Magical light transforms Old Town backyards. 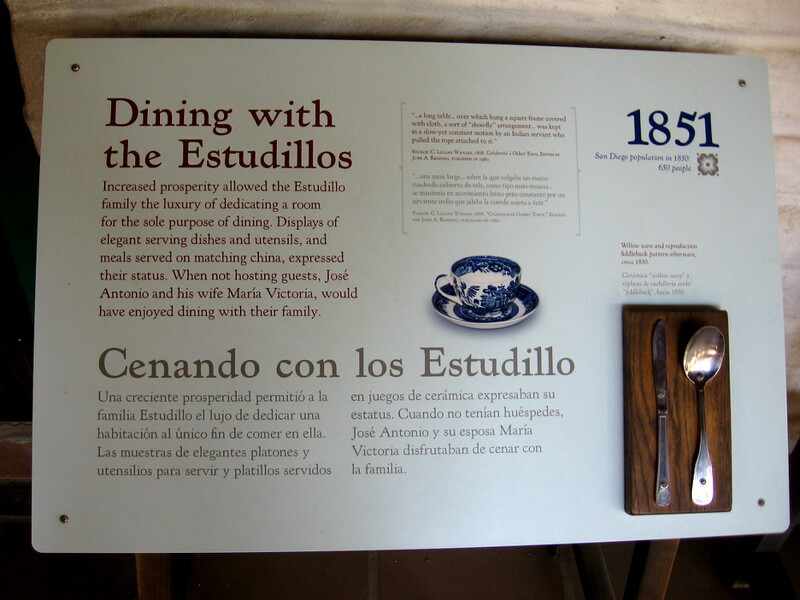 Posted on September 10, 2018 Tags architecture, buildings, construction, historic homes, history, houses, old town, old west, photo, pioneers, san diego, state parks, tourism, travelLeave a comment on Photos of restored rooms inside Casa de Estudillo. 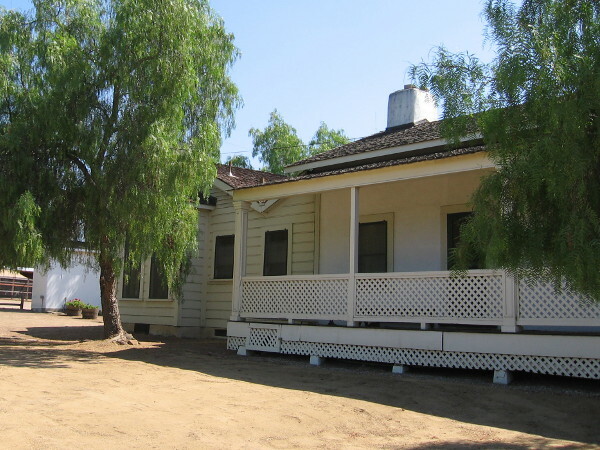 Top Gun House in Oceanside to be restored. Photo from across North Pacific Street in Oceanside of the famous Top Gun House, an historical landmark that will be restored. Today I headed up the coast to enjoy a walk around Oceanside. During my small adventure I paused to look at Oceanside’s famous Top Gun House, which is located at the corner of North Pacific Street and Seagaze Drive. It’s the small beach house in the popular 1986 movie where Maverick ate dinner with his love interest Charlie. 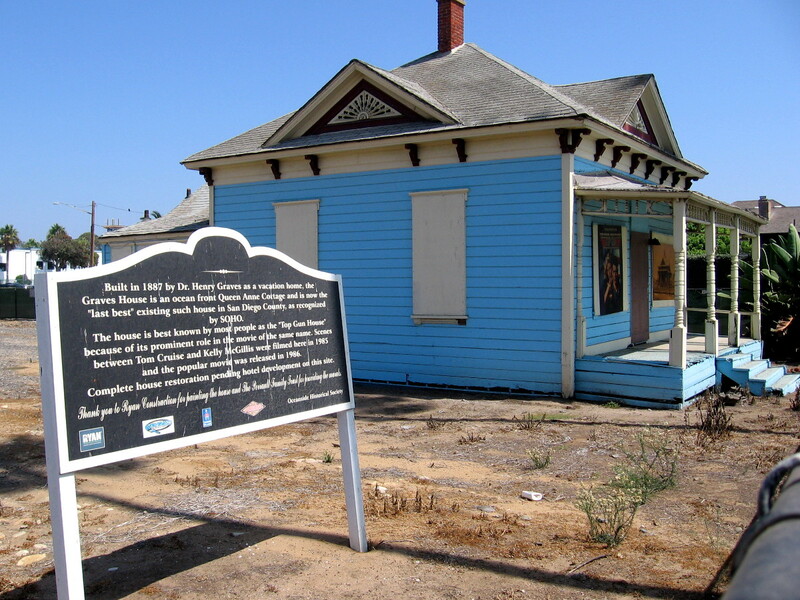 “Built in 1887 by Dr. Henry Graves as a vacation home, the Graves House is an ocean front Queen Anne Cottage and is now the “last best” existing such house in San Diego County, as recognized by SOHO (the Save Our Heritage Organization). The house is best known by most people as the “Top Gun House” because of its prominent role in the movie of the same name. Scenes between Tom Cruise and Kelly McGillis were filmed here in 1985 and the popular movie was released in 1986. Complete house restoration pending hotel development on this site. 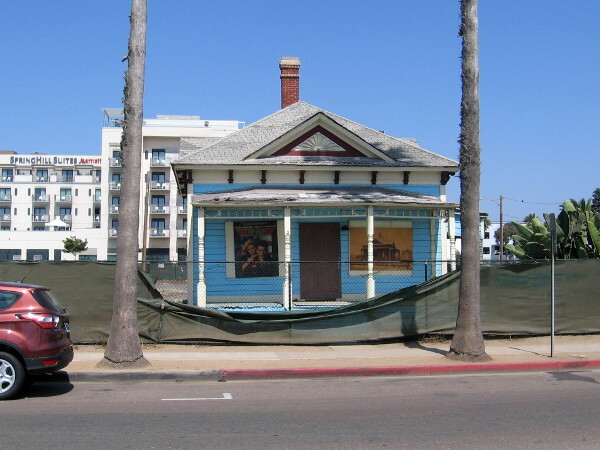 I spoke with a friendly Downtown Ambassador of MainStreet Oceanside at an information table by the foot of the Oceanside Pier, and she said there are plans to not only restore “Charlie’s House”, but to move it one block north, nearer the pier. That valuable oceanfront lot is also awaiting development. 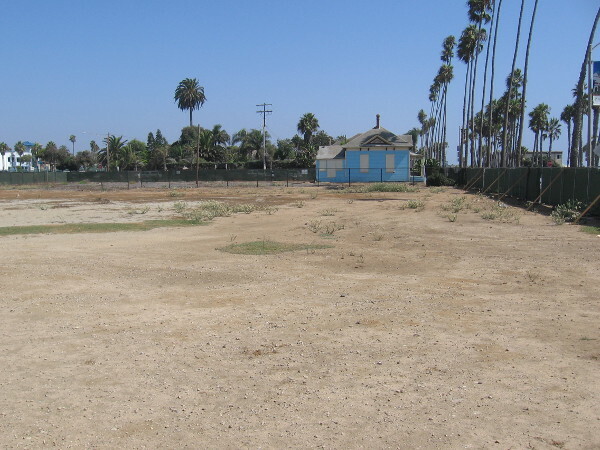 The Top Gun House sits in a corner of a large empty lot that is awaiting development. A hotel will be built here, a block from the Oceanside Pier. A sign near the Top Gun House provides information for curious people walking past. 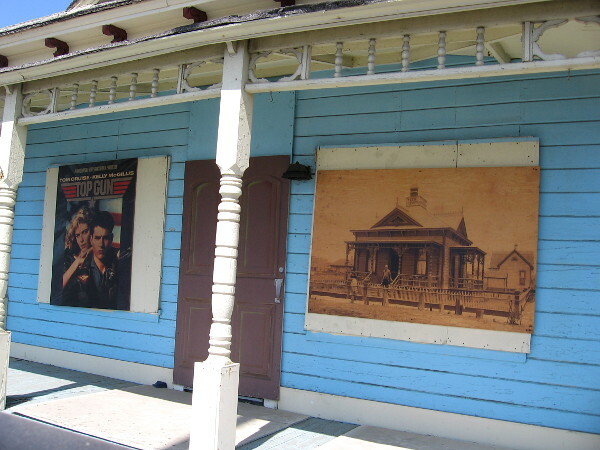 On the front of the house is a classic Top Gun poster and a vintage photo of the house as it once looked, long ago. Photo of the south side of the small Queen Anne style cottage. 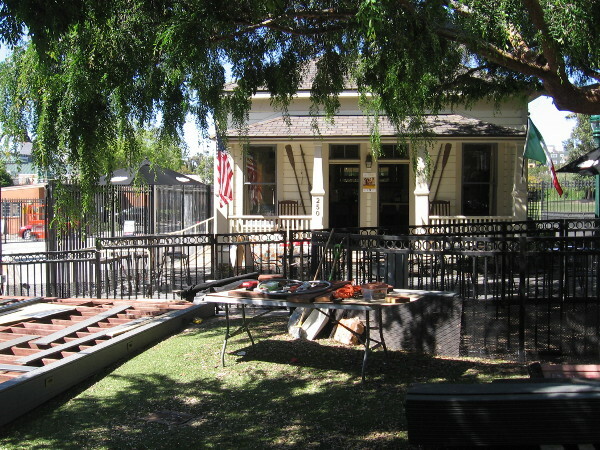 The famous Top Gun House will be restored and enjoyed by the local community and the movie’s many fans for years to come. 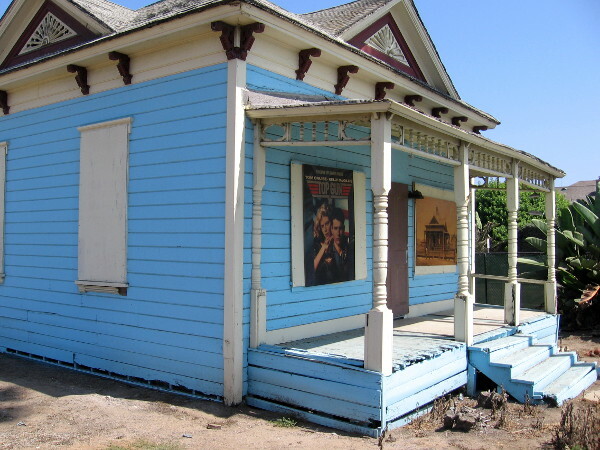 Posted on August 25, 2018 August 25, 2018 Tags beaches, entertainment, film, historic homes, history, houses, movies, oceanside, photo, pop culture, tom cruise, top gun, tourism, travelLeave a comment on Top Gun House in Oceanside to be restored. 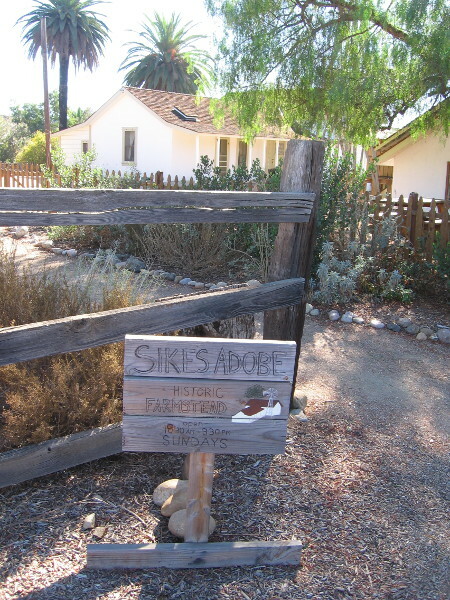 A walk around the the Sikes Adobe Farmhouse. 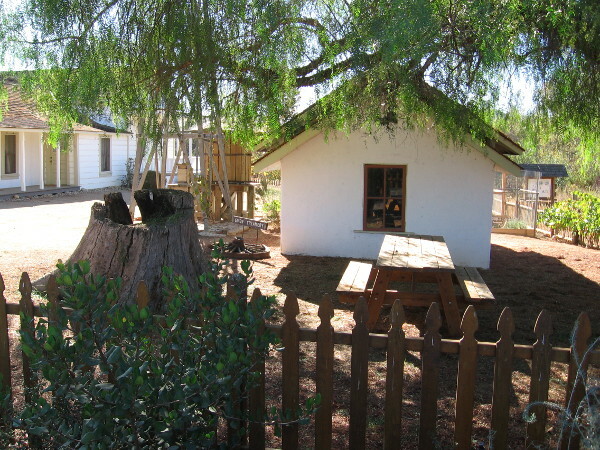 Photo of the rustic Sikes Adobe Farmhouse on a sunny November day. This morning I drove up to Escondido. 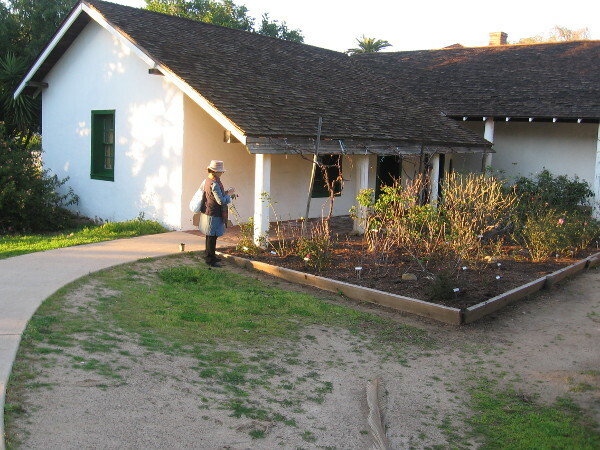 One highlight of my day was walking around the historic Sikes Adobe Farmhouse, which is located near a popular trailhead of the San Dieguito River Park’s long, not-yet-complete Coast to Crest Trail. 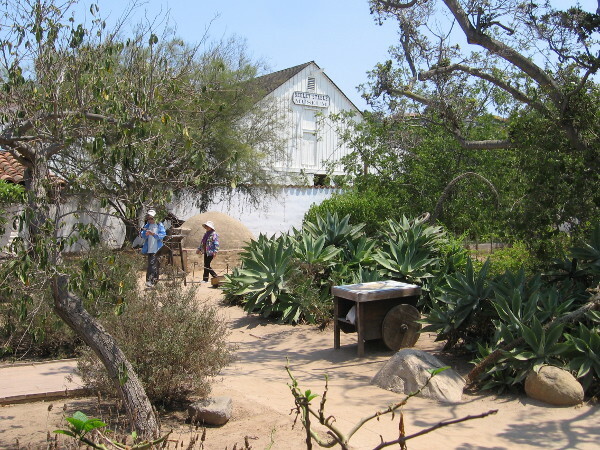 The Sikes Adobe, built around 1870, is a City of San Diego historic site. It contains a museum which is open every Sunday. 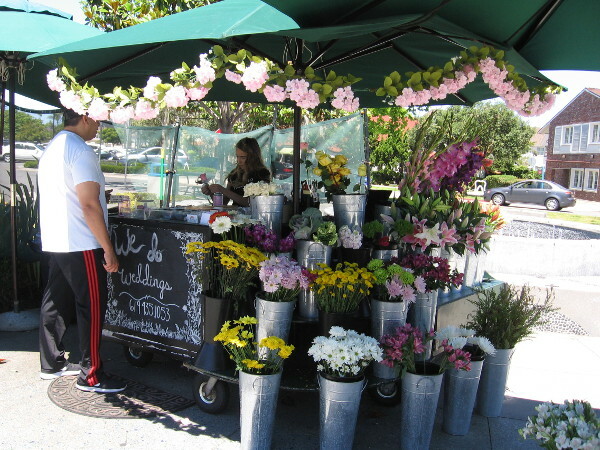 Also on Sundays, the farmstead is where the North San Diego Certified Farmers Market is held. 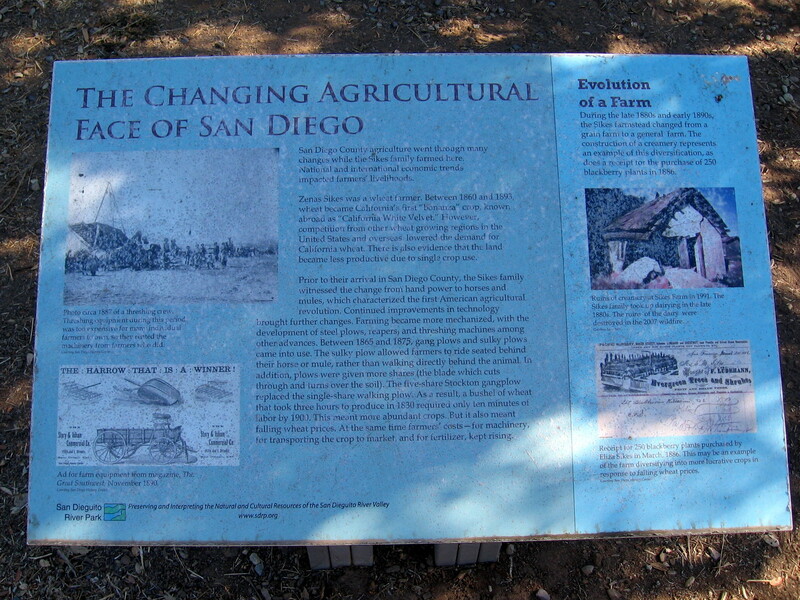 As I walked around Sikes Adobe, I happened upon some interpretive signs which explain the history of the farmstead. I took photos if you’re interested. Click those sign images and they will expand for easy reading. 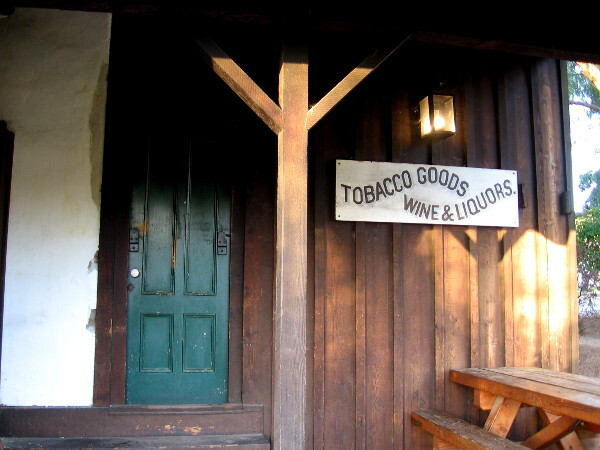 People had very different lives long ago in California. Fresh air, hard work, quiet hours, simple pleasures. And wild, untrod paths. I believe I would have loved that life. 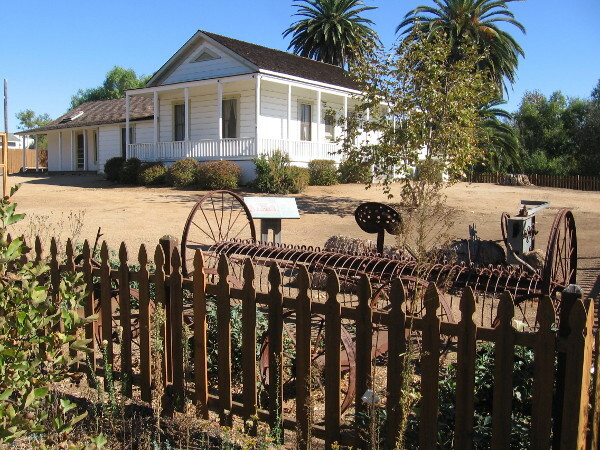 The historic Sikes Adobe Farmhouse is located near a trailhead of the Coast to Crest Trail, just east of Lake Hodges. 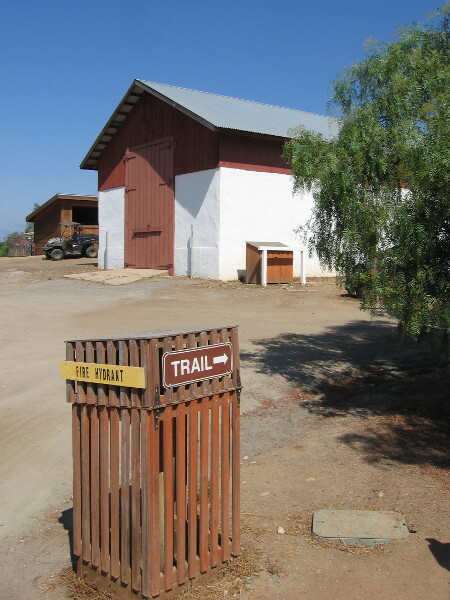 The trail past the farmstead is popular with hikers, mountain bikers and equestrians. 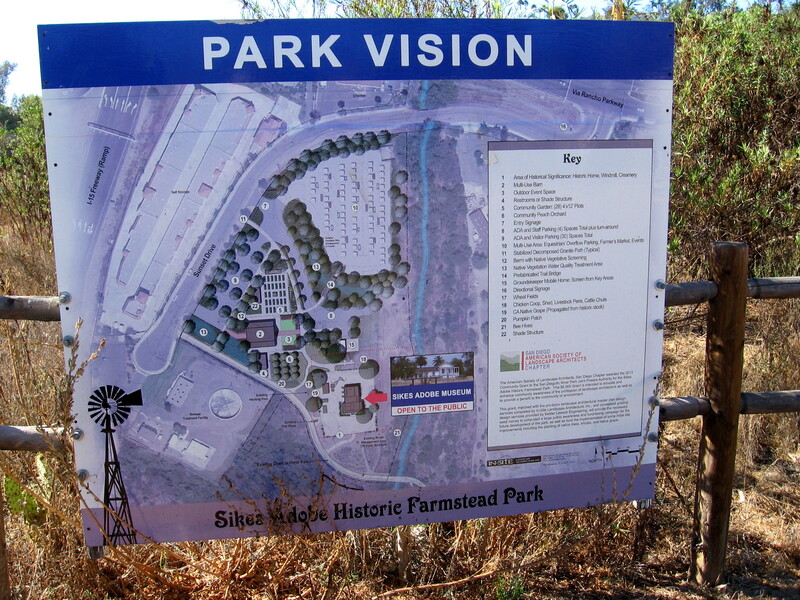 A sign shows proposed improvements to the Sikes Adobe Historic Farmstead Park, including event space and a reconstructed barn. 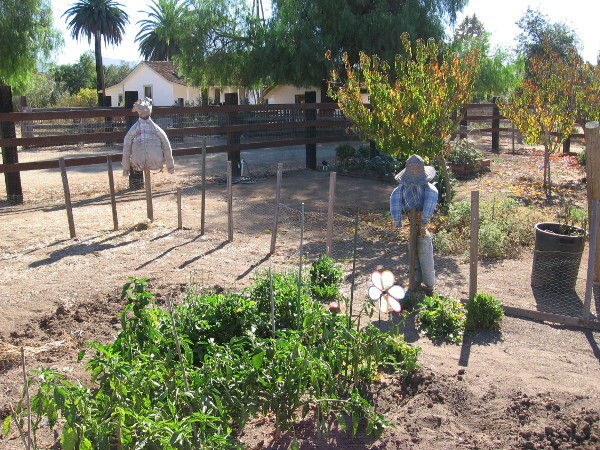 Scarecrows stand guard inside a community garden near the rustic farmhouse. Approaching the Sikes Adobe. One can tour the inside on Sundays, from 10:30 am to 3:30 pm. In this photo you can see the small creamery building and the base of the restored windmill. 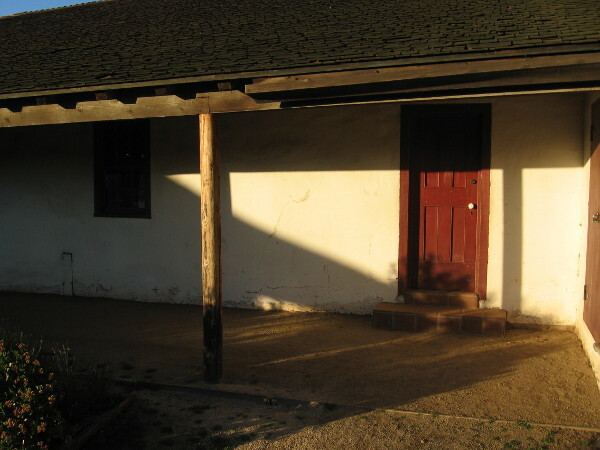 A simple adobe house, typical of the early American era, shortly after California had achieved statehood. 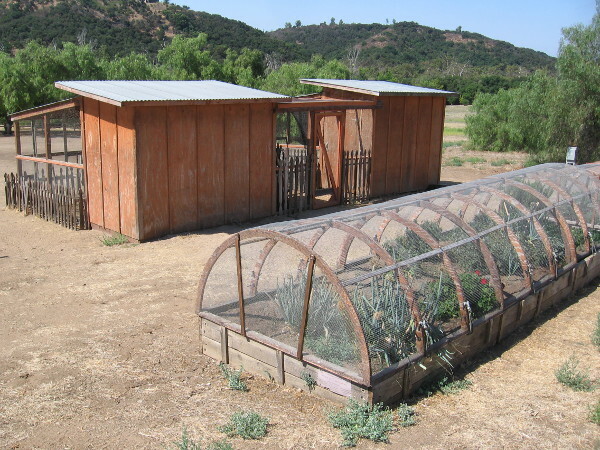 View of the farmstead structures from the nearby trail. 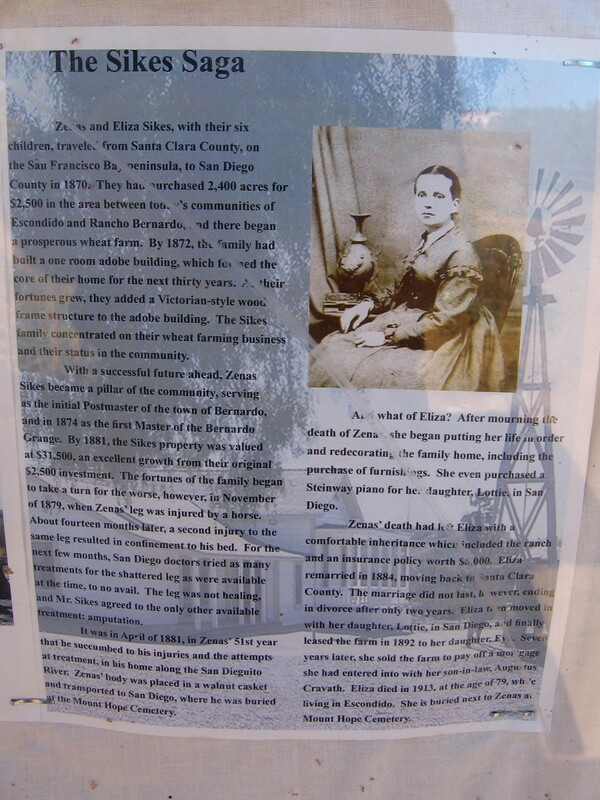 Zenas and Eliza Sikes, with six children, arrived in 1870 and began their wheat farm here between the communities of Escondido and Rancho Bernardo. 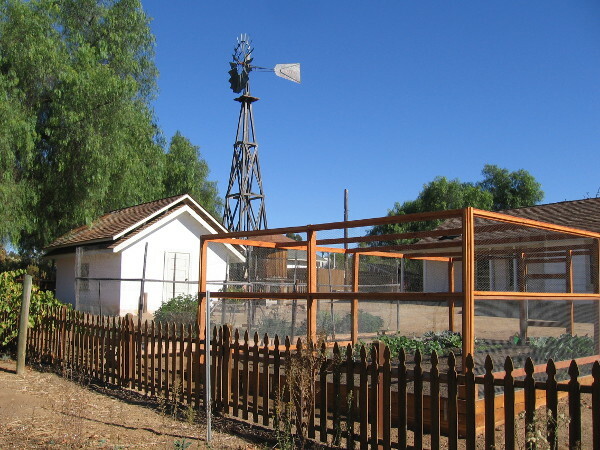 A small vegetable garden near the restored windmill and creamery. Old rusty farm equipment in a corner of the farmstead. 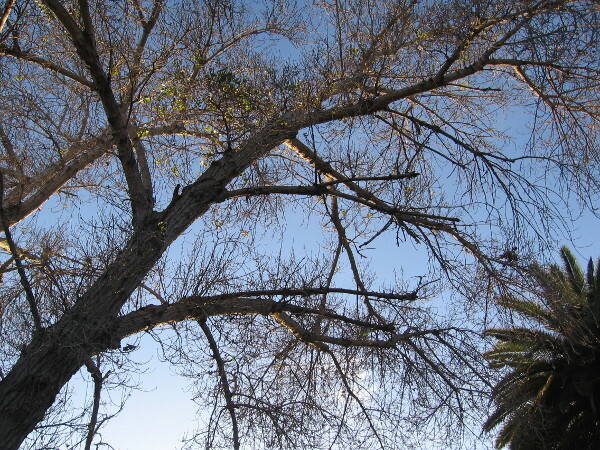 Between 1860 and 1893, wheat was California’s first bonanza crop. 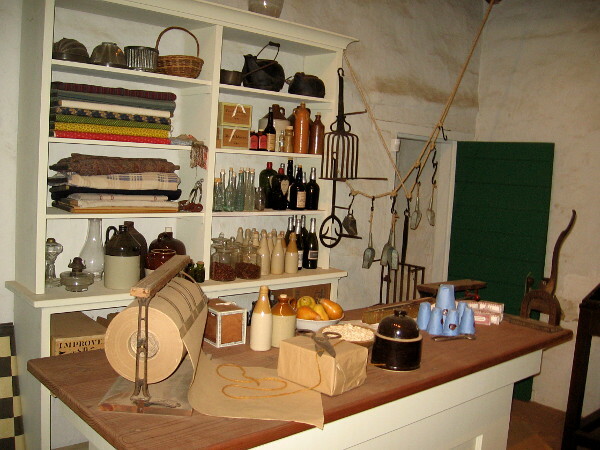 The creamery at Sikes Farm was built in the 1880s as their farm diversified and became more generalized. 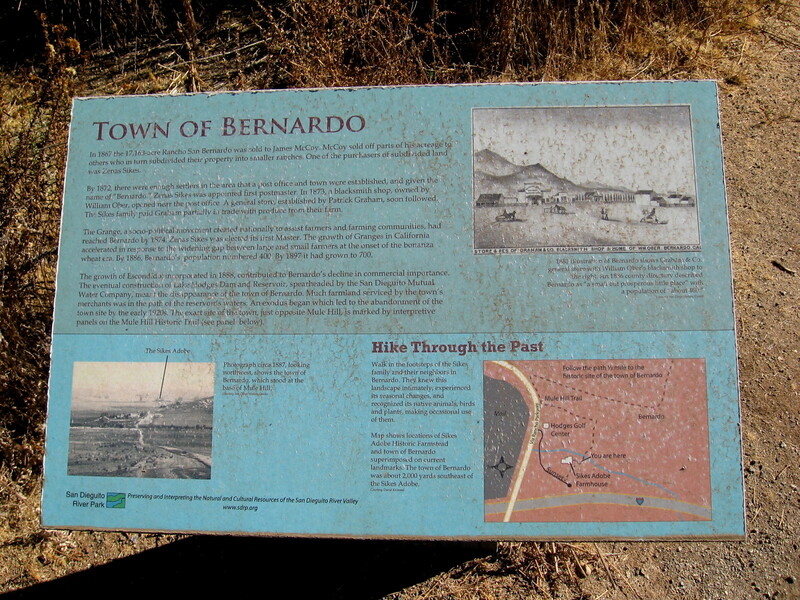 A small town called Bernardo used to be located a couple miles southeast of the Sikes Adobe. The construction of the Lake Hodges Dam spelled the end for that town. 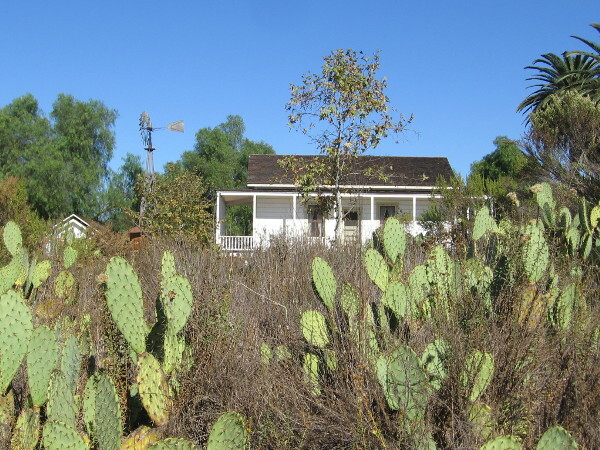 Looking from the nearby trail past prickly pears at the farmhouse. Some horses have arrived at the trailhead’s dirt parking lot. 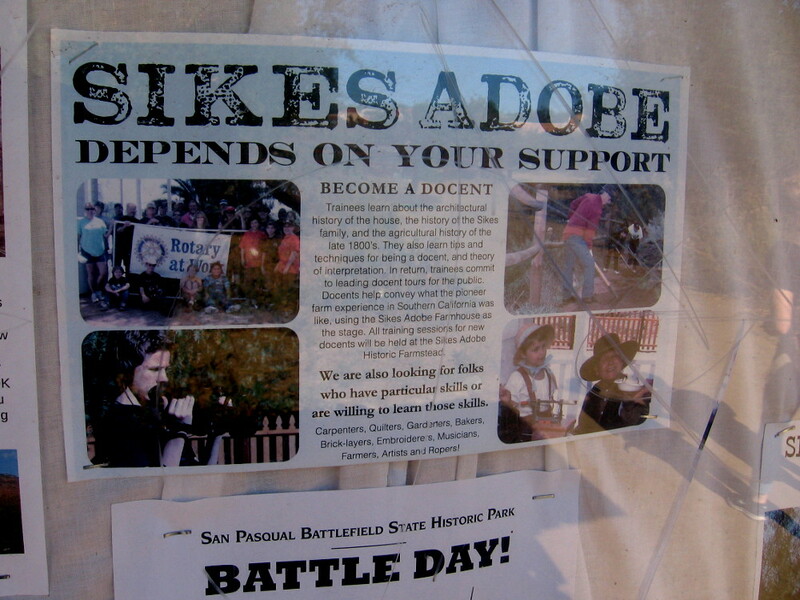 Sikes Adobe depends on your support. 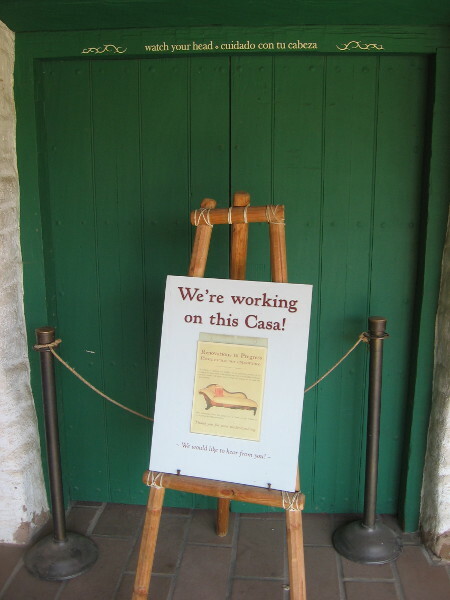 Become a docent or volunteer! 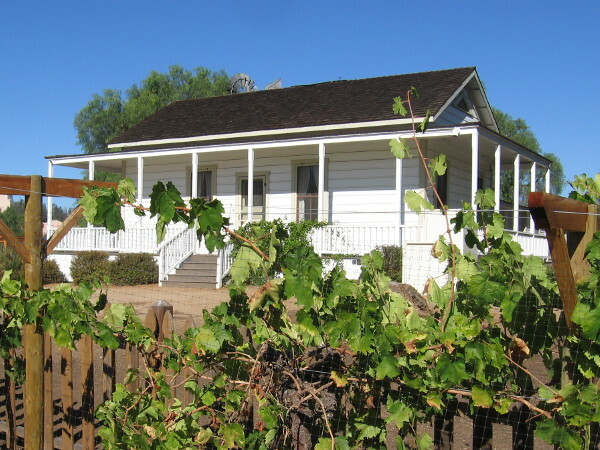 The Sikes Adobe Farmhouse rises behind a row of green grape vines. 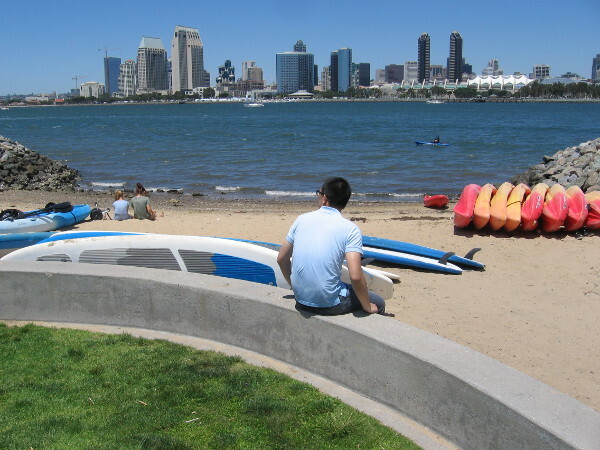 Here’s the Cool San Diego Sights main page, where you can read the most current blog posts. If you’re using a small mobile device, click those three parallel lines up at the top–that opens up my website’s sidebar, where you’ll see the most popular posts, a search box, and more! 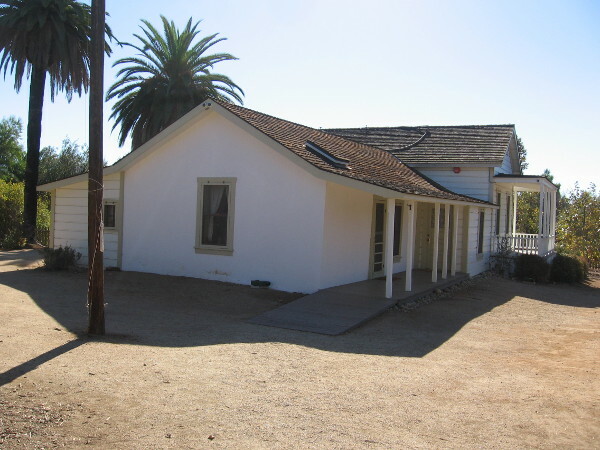 Posted on November 18, 2017 November 18, 2017 Tags buildings, california, escondido, farming, historic homes, history, museums, old west, photography, pioneers, san diego, tourism, travel, walkingLeave a comment on A walk around the the Sikes Adobe Farmhouse. 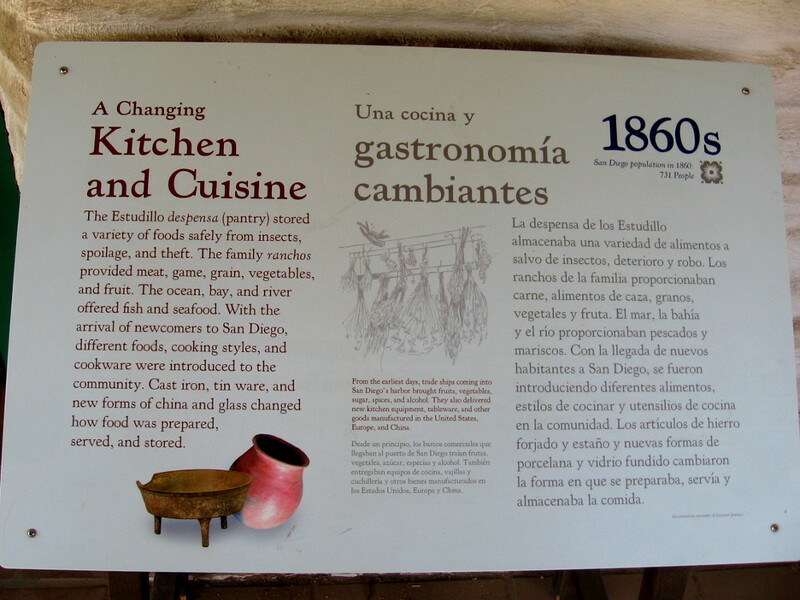 History at the Los Peñasquitos adobe ranch house. 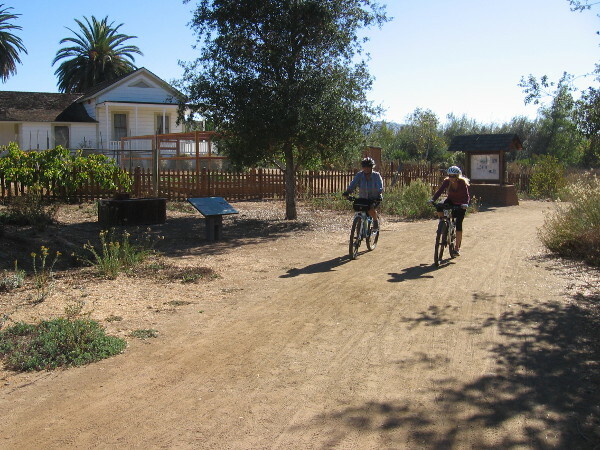 Jogging and biking past the historic adobe ranch house in Los Peñasquitos Canyon Preserve. 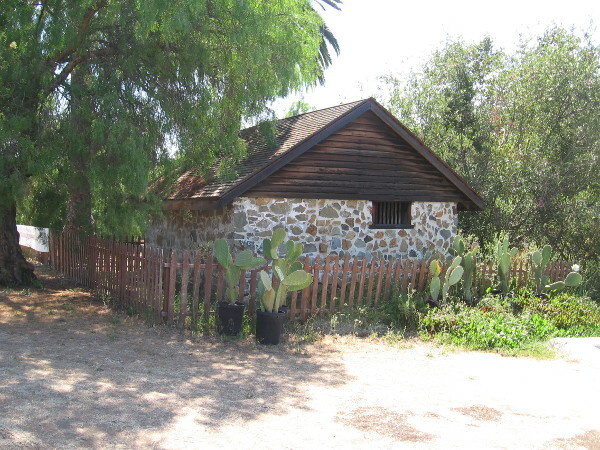 The second oldest residence in San Diego County can be found inside Los Peñasquitos Canyon Preserve. 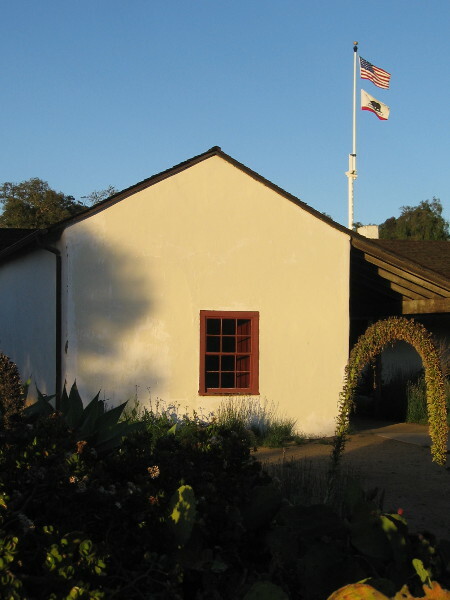 The adobe ranch house was built in 1823 by Captain Francisco María Ruiz, who was Commandante of San Diego’s presidio. 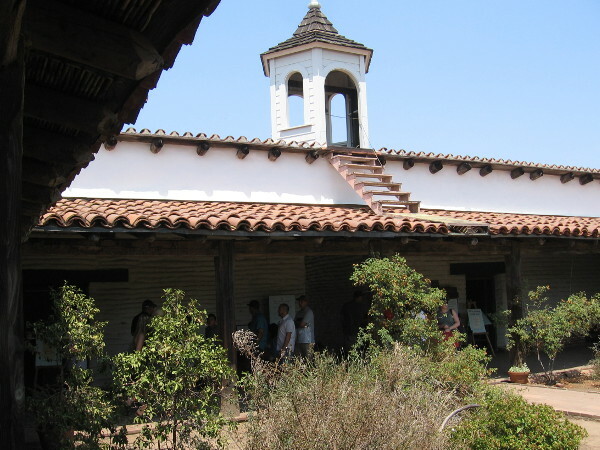 He built two small adobe buildings on Rancho Santa Maria de Los Peñasquitos, his large 8,486-acre Mexican land grant north of the Presidio and Mission San Diego de Alcalá. 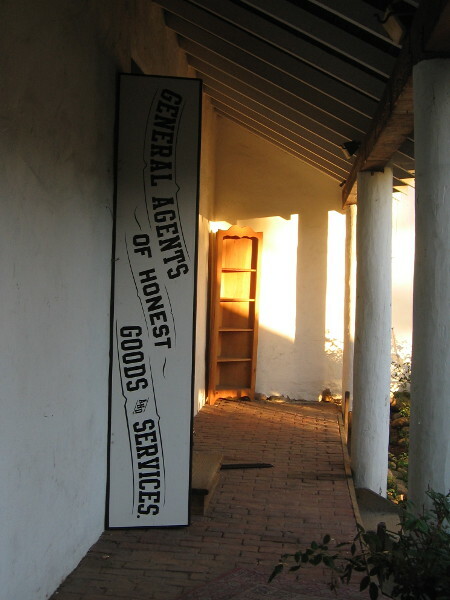 It was first land grant made by the Mexican government in this area, just two years after Mexico became independent from Spain. 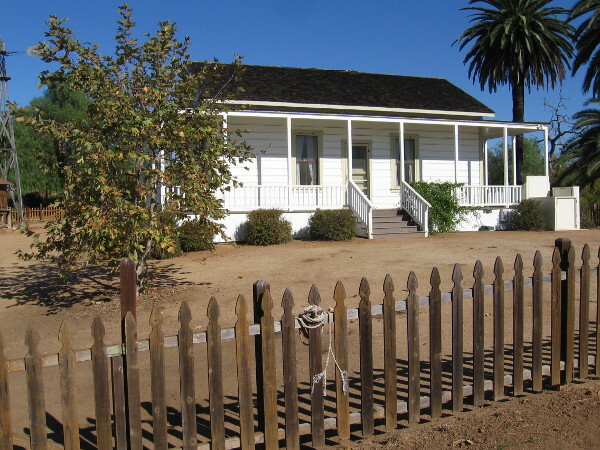 The historic adobe ranch house has been modified, enlarged and restored by various owners over the years, and today is a popular destination for visitors to Los Peñasquitos Canyon Preserve. 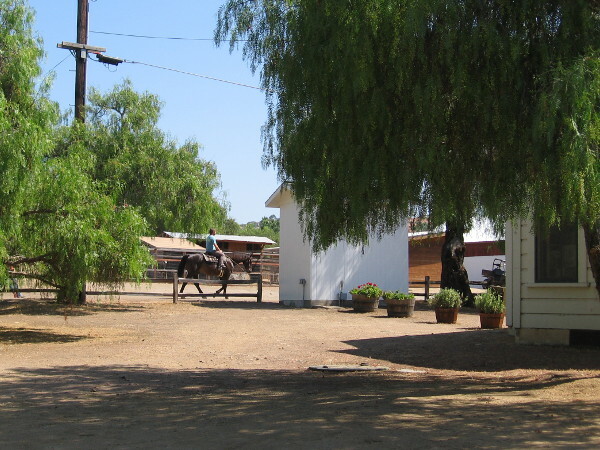 People often bike or hike through the picturesque ranch, and motorists can park in a nearby lot. 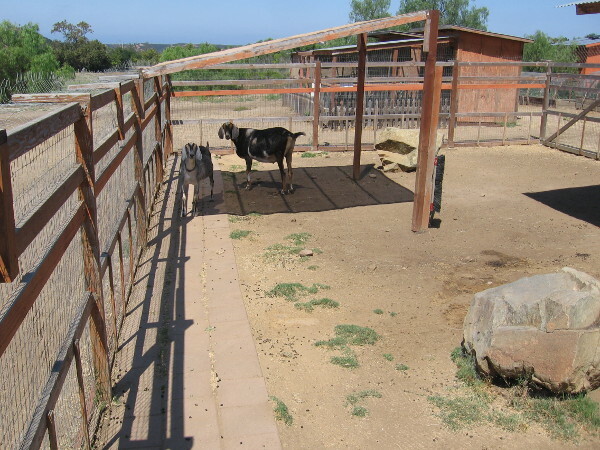 Picnic tables are plentiful; there are goats and chickens to captivate children; and guided tours are available on weekends. I toured the ranch recently and took photos of its various features. 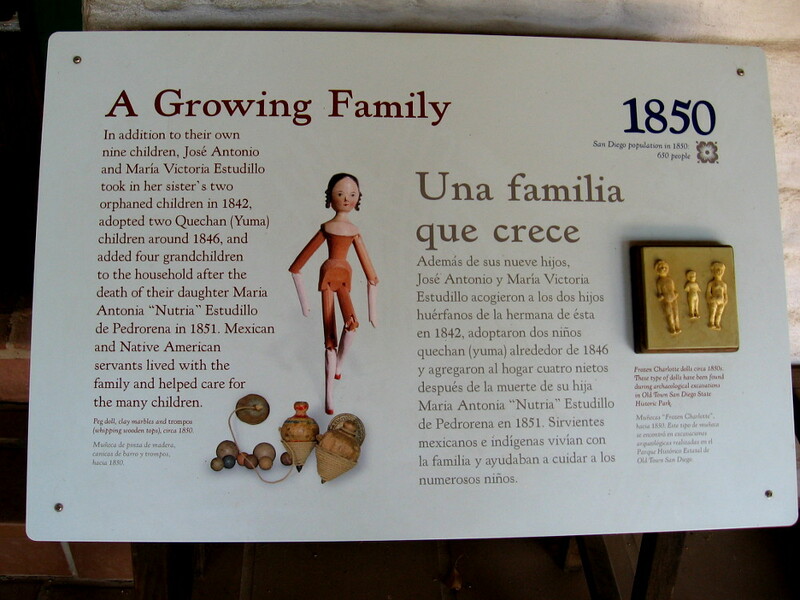 There are a variety of interpretive exhibits within the adobe house. 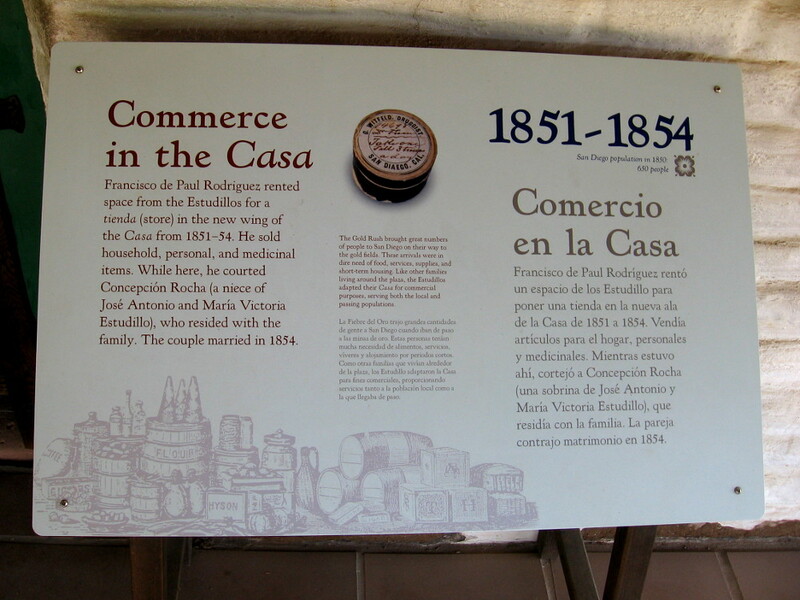 Please read these informative displays (click to enlarge the images) to learn more about this fascinating place’s long and colorful history. 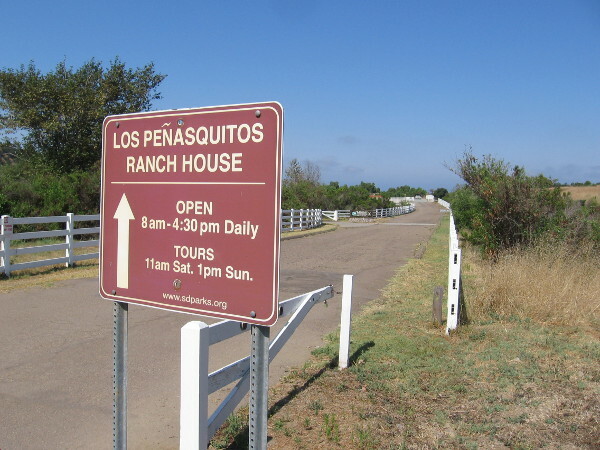 The Los Peñasquitos Ranch House is open daily from 8:00 am to 4:30 pm. Guided tours are at 11:00 am on Saturday and 1:00 pm on Sunday. The ranch house is nestled among some shady trees. 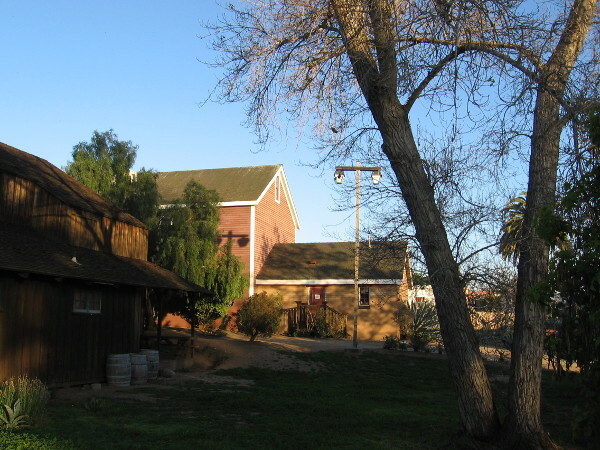 Two small adobe buildings were originally built in 1823. 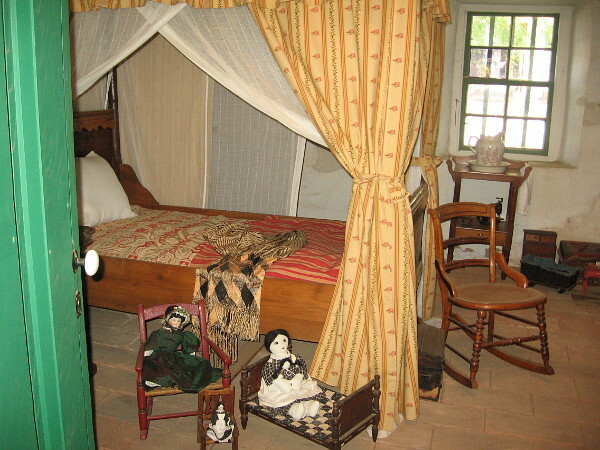 The house was enlarged by Captain George Alonzo Johnson in 1862. 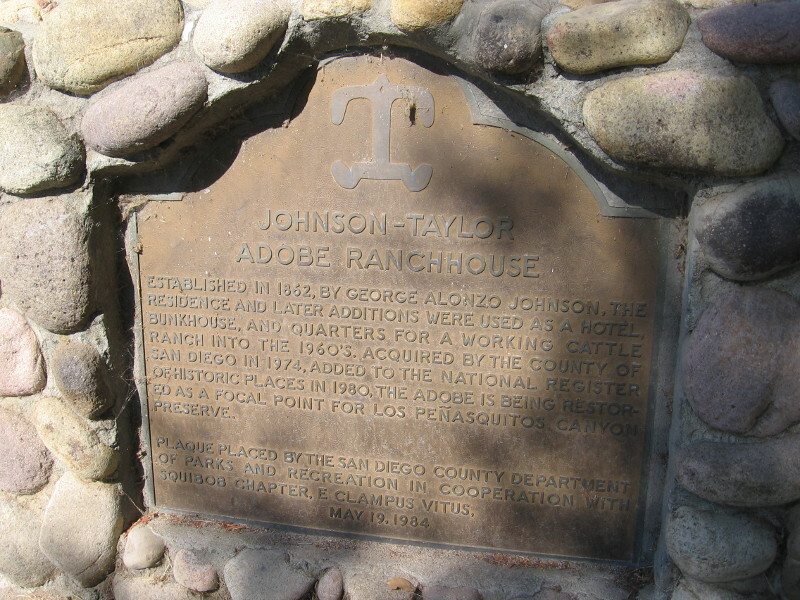 Plaque describes the establishment of the Johnson-Taylor Adobe Ranchhouse in 1862. 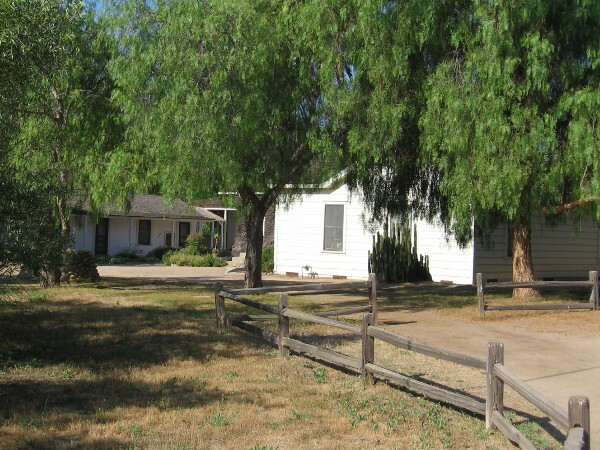 The residence and later additions were used as a hotel, bunkhouse, and quarters for a working cattle ranch into the 1960s. 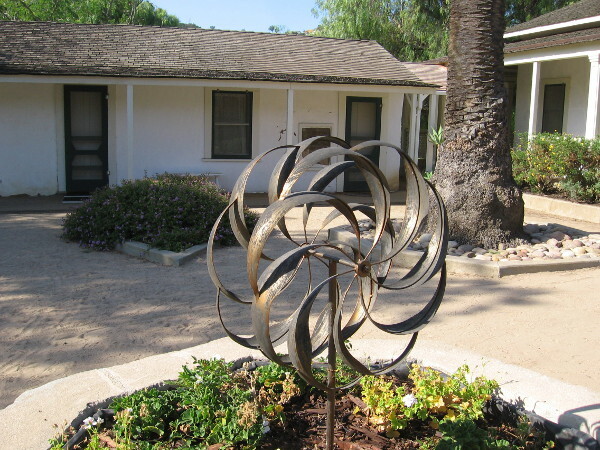 A sculpture inside the courtyard, located on the east side (rear) of the ranch house. The planters were probably used by the residents to grow herbs and flowers. 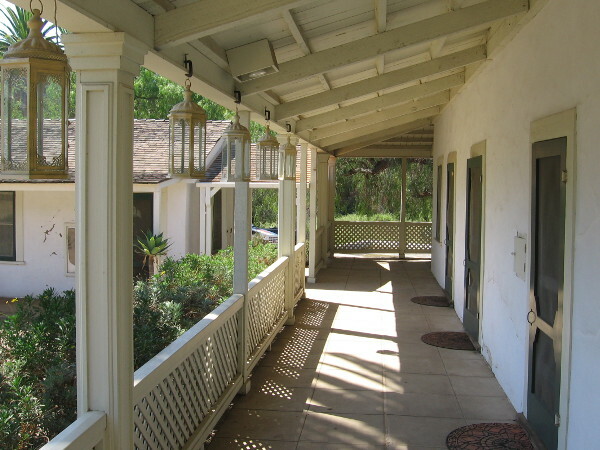 Part of the ranch house’s long porch beside the courtyard. 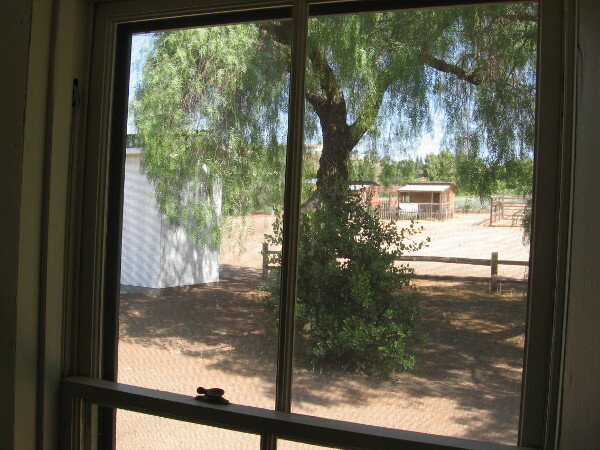 Inside a living room that today contains museum-like exhibits, looking north out a window at various small structures on the ranch, including a chicken coop and goat pen. 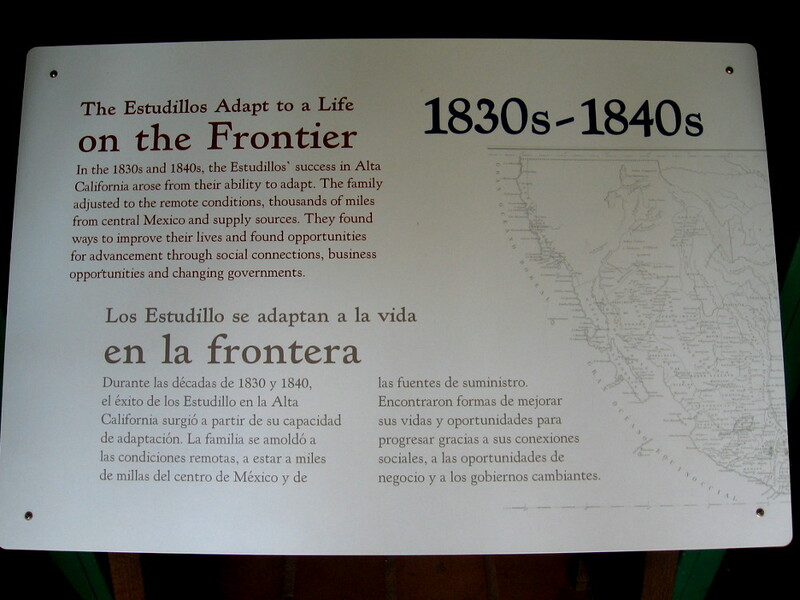 The Californio Period, 1821 to 1850, included vaqueros (cowboys) living at Peñasquitos. 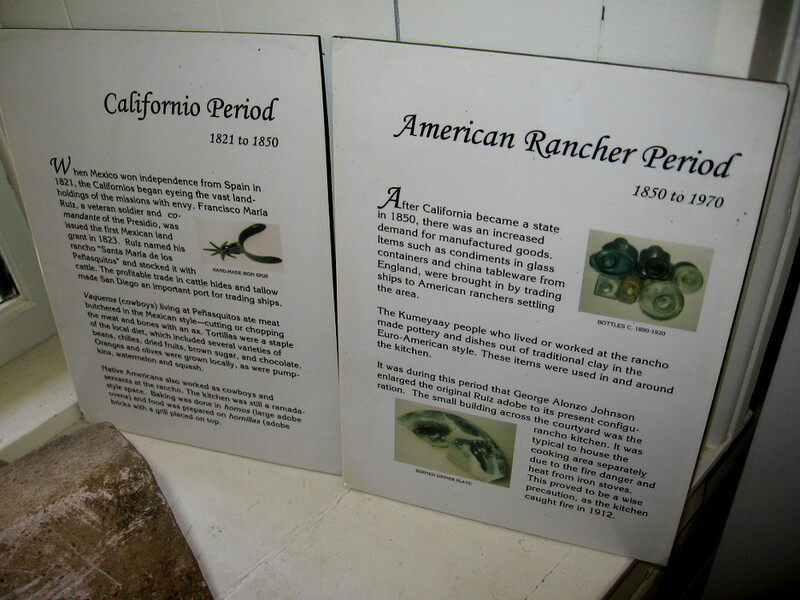 The American Rancher Period, 1850-1970, began after California became a state. 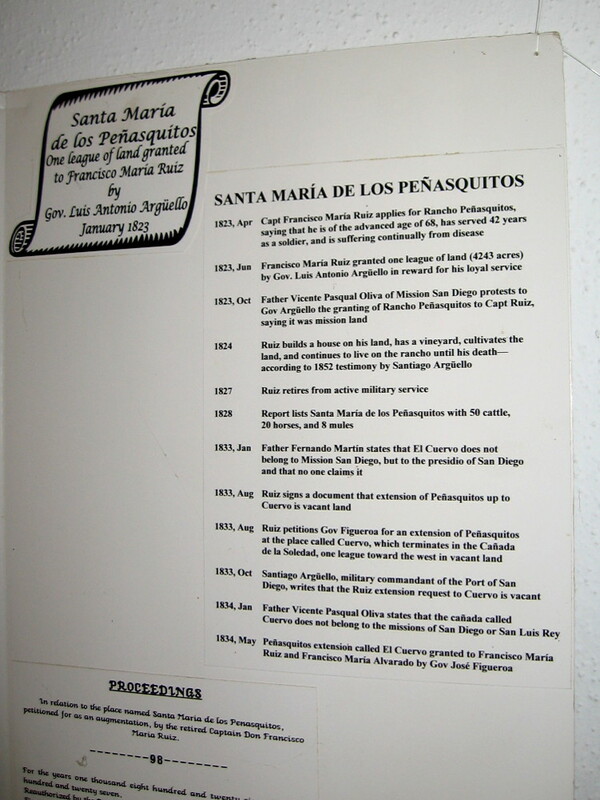 1823-1834 timeline of the Mexican land grant of Santa Maria de Los Peñasquitos, that was made to Captain Francisco María Ruiz. 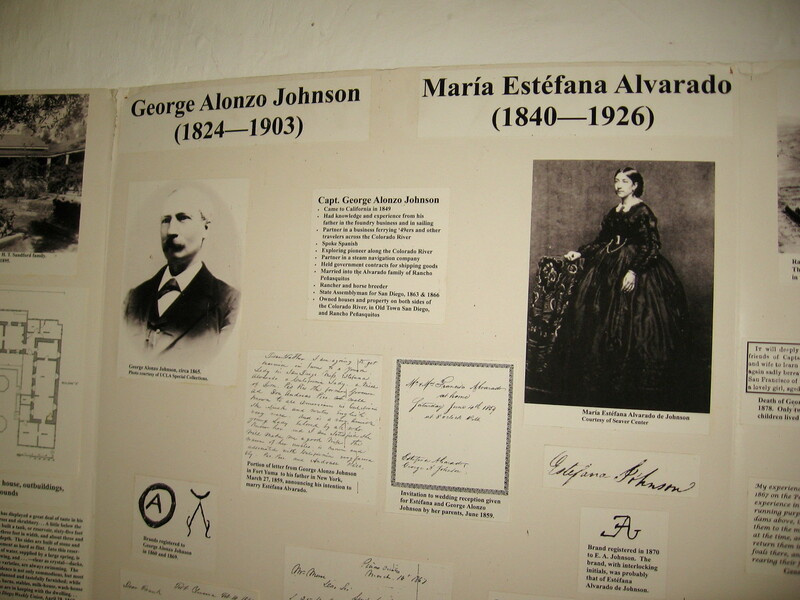 In 1859 Captain George Alonzo Johnson married Maria Estéfana Alvarado, daughter of Francisco María Alvarado, who bought the ranch from Ruiz in 1837. 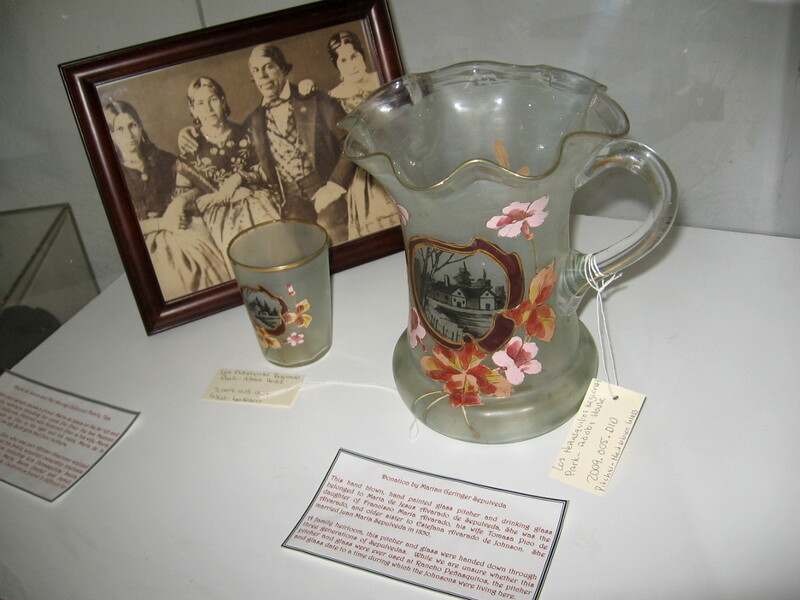 A hand blown and painted glass pitcher and drinking glass that belonged to Maria de Jesus Alvarado de Sepulveda, daughter of Francisco María Alvarado. 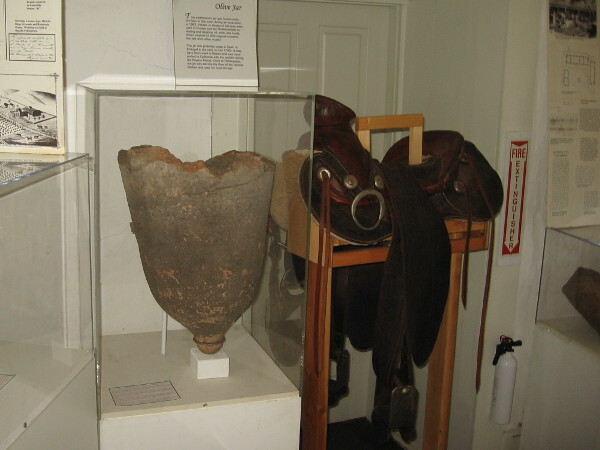 The large earthenware olive jar was found under the ranch house floor during an excavation in 1983. 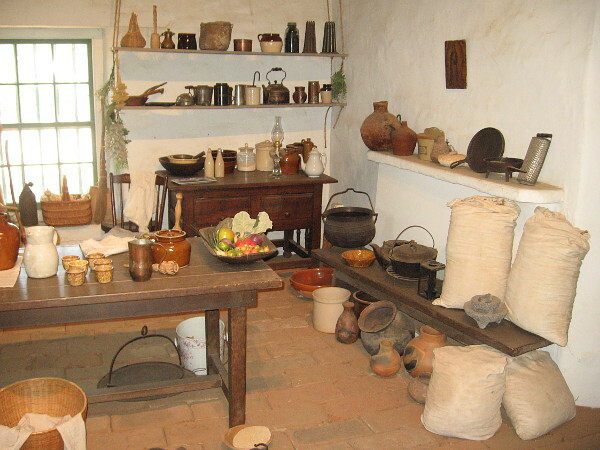 Used for food storage, it was probably made in Spain or Portugal in the early to mid 1700s. 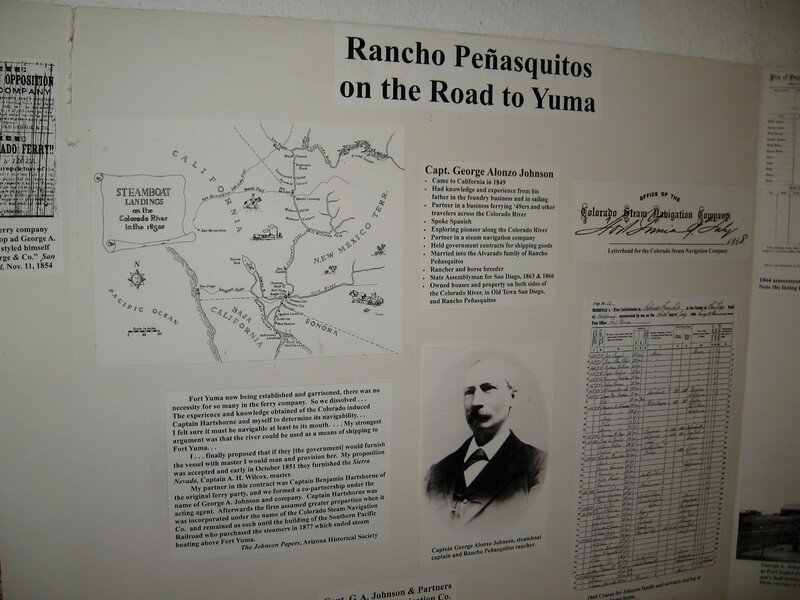 Captain George Alonzo Johnson, a pioneer and businessman, came to California in 1849 during the Gold Rush. 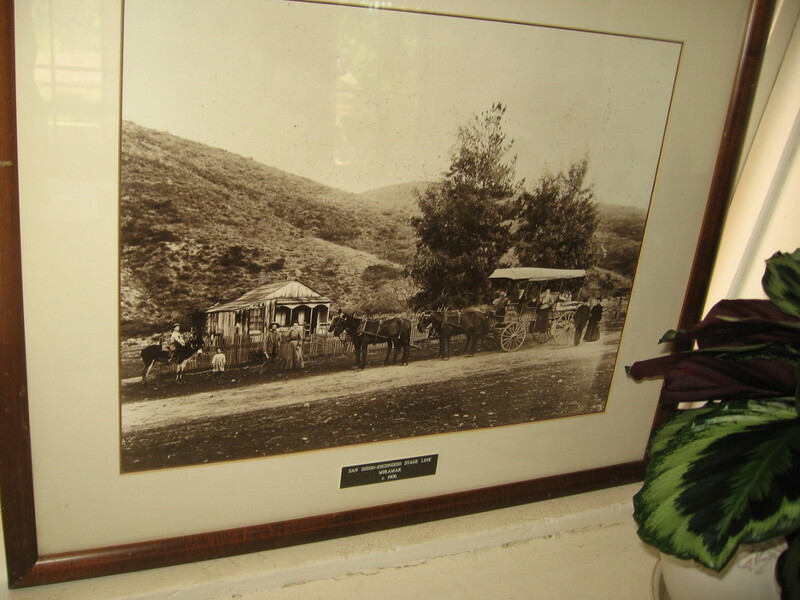 He became a rancher and horse breeder. 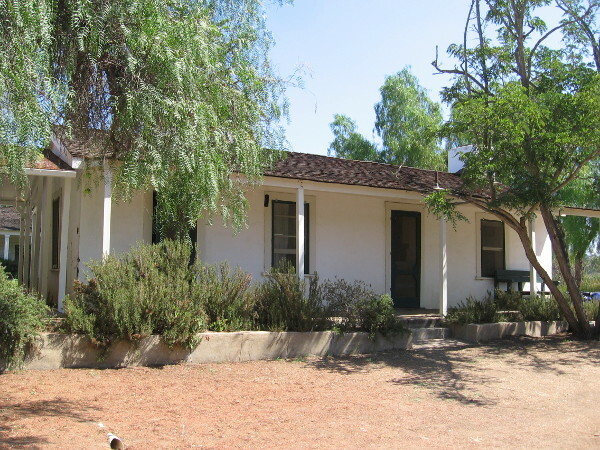 Historical newspaper articles describe the ranch house, outbuildings and grounds of George Alonzo Johnson’s ranch. 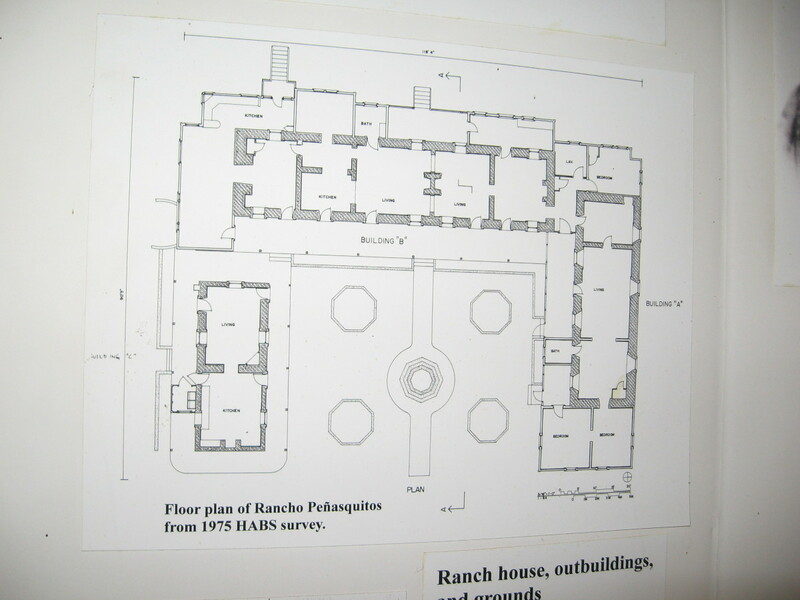 Floor plan of Rancho Peñasquitos from 1975 HABS survey. 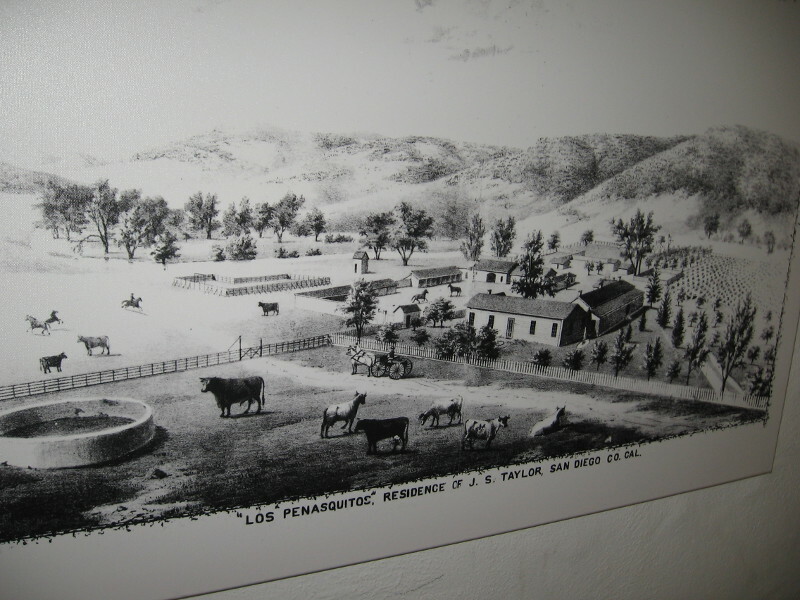 A drawing of the Los Peñasquitos residence of Colonel Jacob Shell Taylor, who purchased the property in 1882. He raised Durham cattle and thoroughbred horses and would found Del Mar. 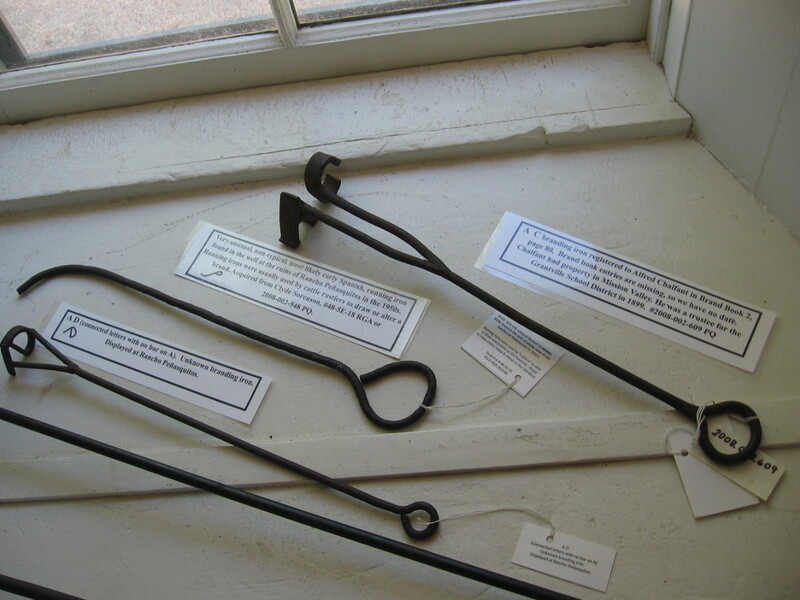 Various branding irons on display in the adobe house that were discovered around the ranch. 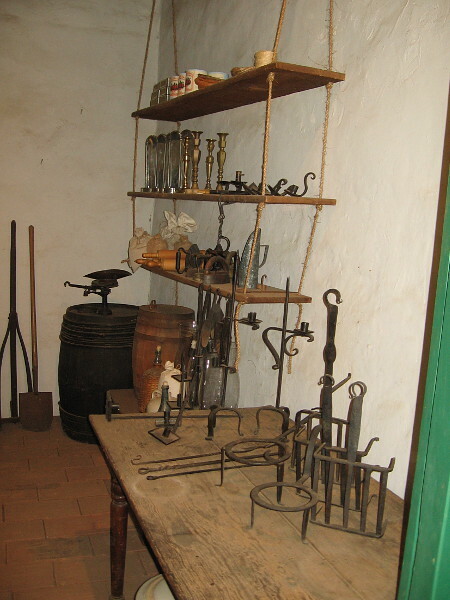 Included are early Spanish irons used by rustlers. 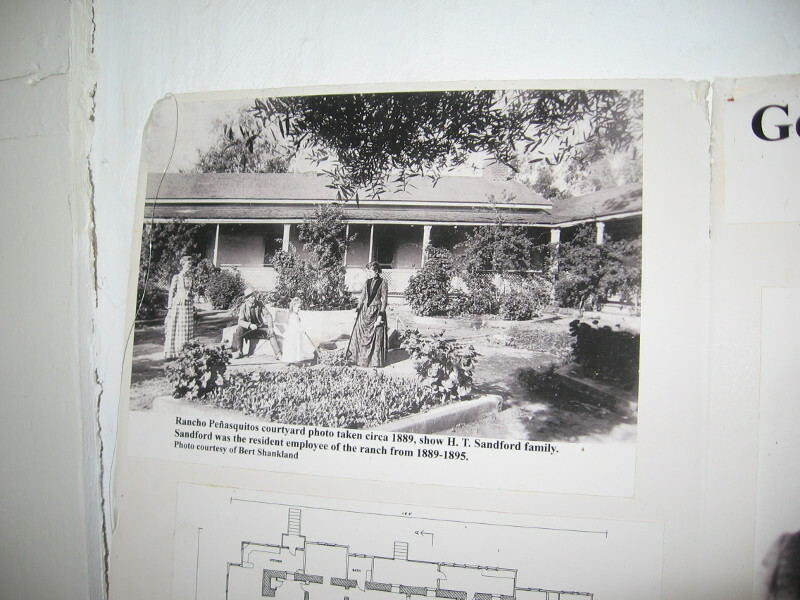 Rancho Peñasquitos courtyard photo taken circa 1889, showing ranch employee H. T. Sandford and his family. Photo of the San Diego-Escondido Stage Line circa 1906. 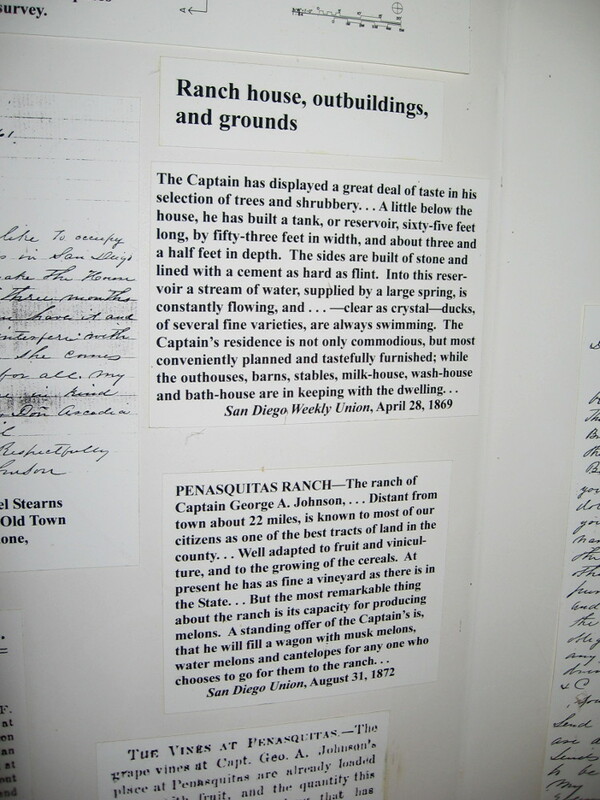 In the mid-1800s, Peñasquitos was a way station on the wagon road between San Diego and Warner’s Ranch. 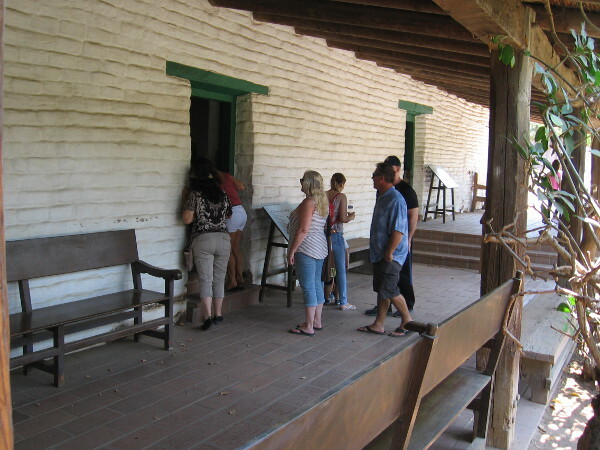 Porch along the front (or west) side of the adobe ranch house, which faced the so-called Road to Yuma. I spotted someone riding a horse past the ranch house. 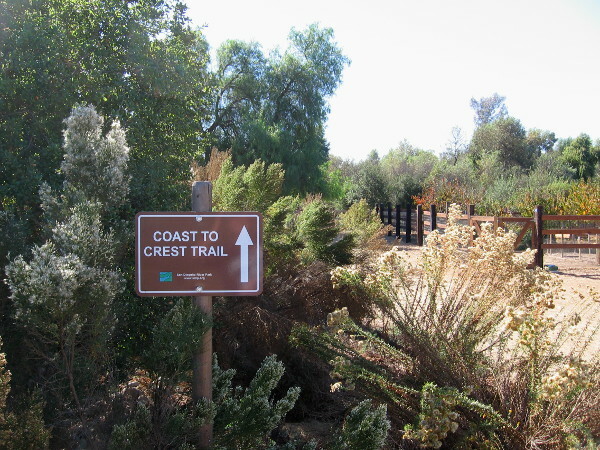 Los Peñasquitos Canyon Preserve is an ideal place for those who love to ride down peaceful trails. 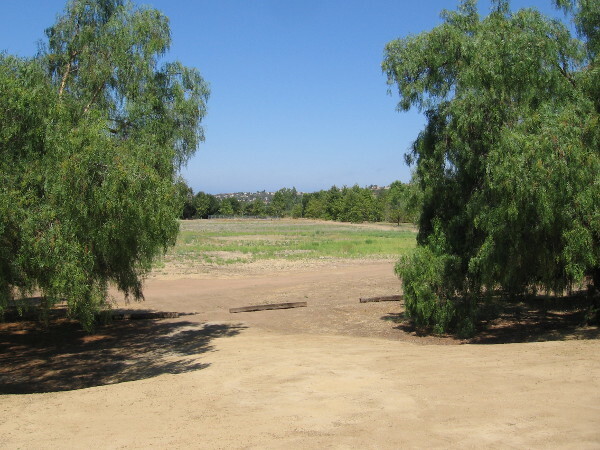 Looking west at a meadow north of Peñasquitos Creek. I posted photos of those sycamores in the distance a few weeks ago. 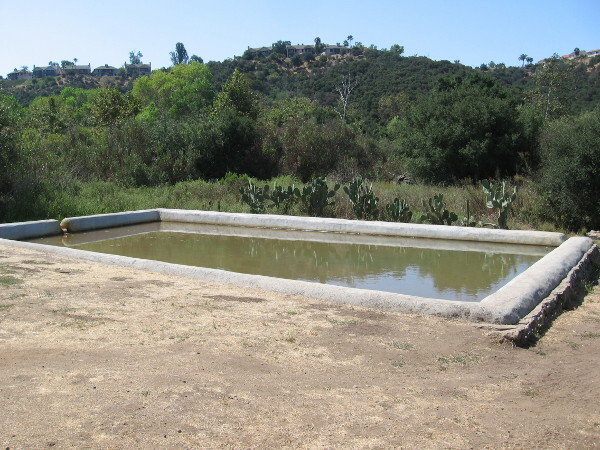 An artificial pond south of the ranch house was filled with water from the adjacent spring house for irrigation of a nearby citrus grove. 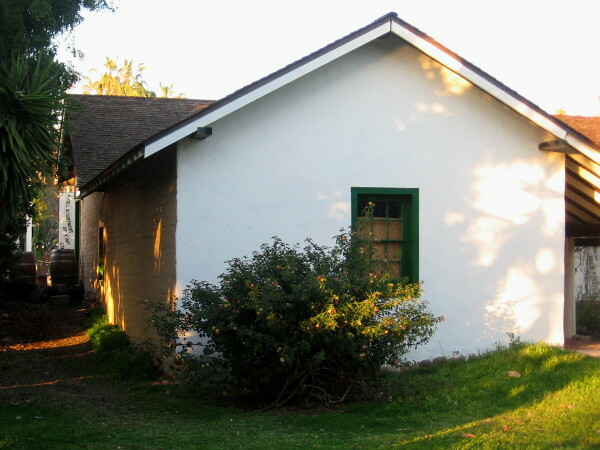 The rock Spring House was constructed around an artesian spring. 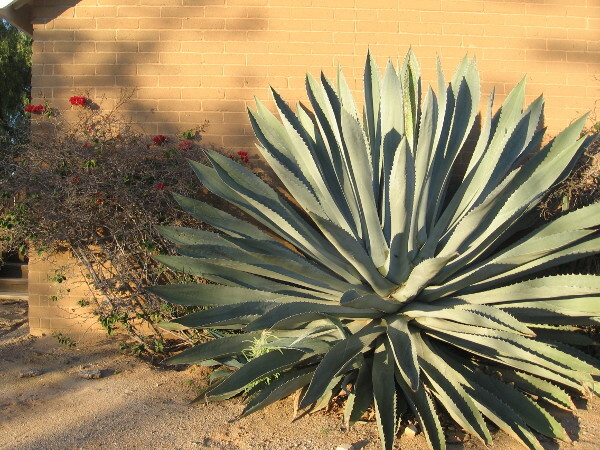 Water from the spring was used by the Native American Kumeyaay for as many as 12,000 years! 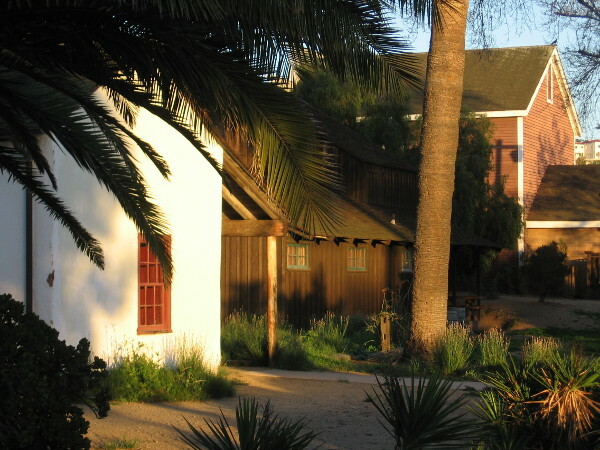 The Mohnike Barn was constructed in 1912 of adobe and wood. 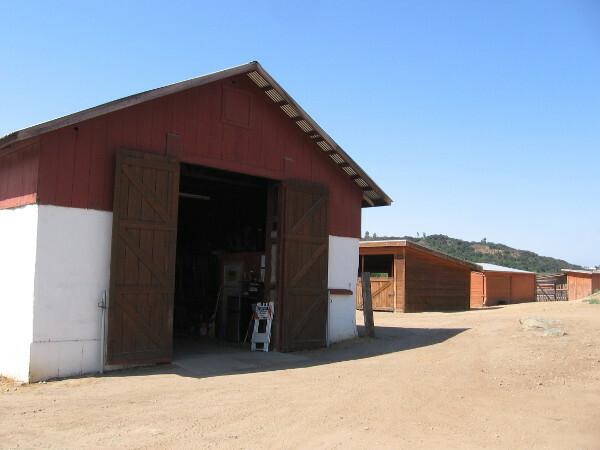 Charles Mohnike, a rancher who purchased the property in 1910, was the builder. 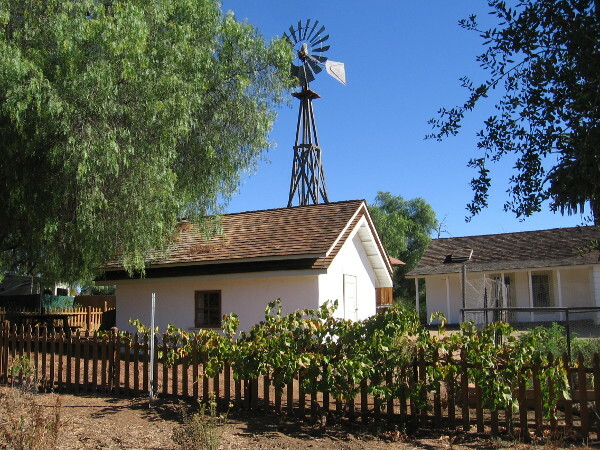 The Mohnike Barn is now listed on the National Register of Historic Places along with other ranch structures. 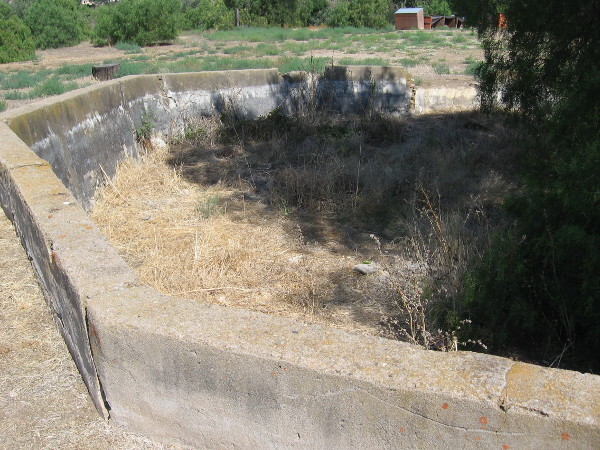 An octagonal concrete reservoir to the north, uphill from the ranch house. Photographic evidence shows water might have been pumped up here by windmill. More ranch structures just west of the barn. These friendly Nubian goats like to greet hikers and those on bicycles. 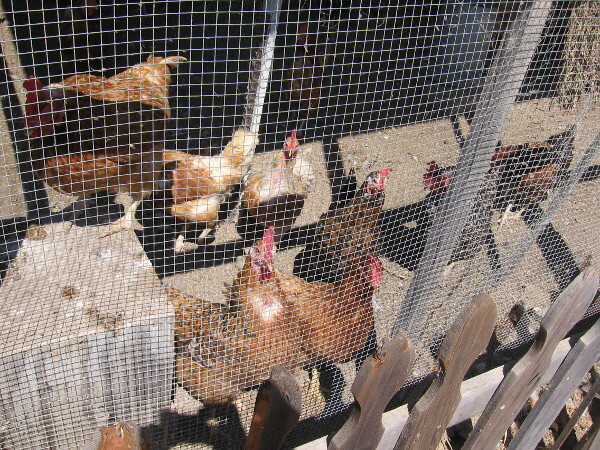 These chickens were wondering what I was up to. 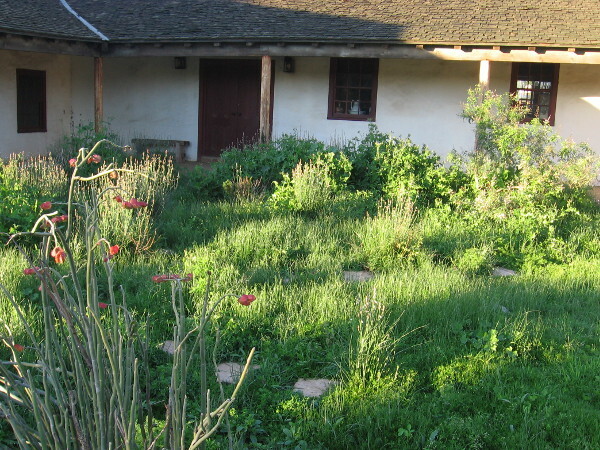 The southeast corner of the adobe ranch house. 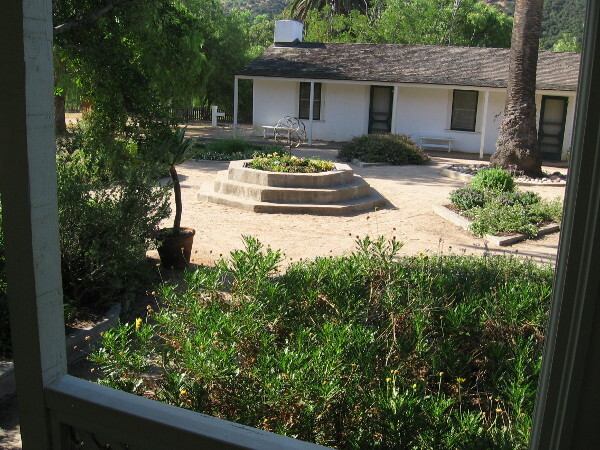 One last photo of the courtyard, a focal point of the ranch house, which has seen many lives, much history. 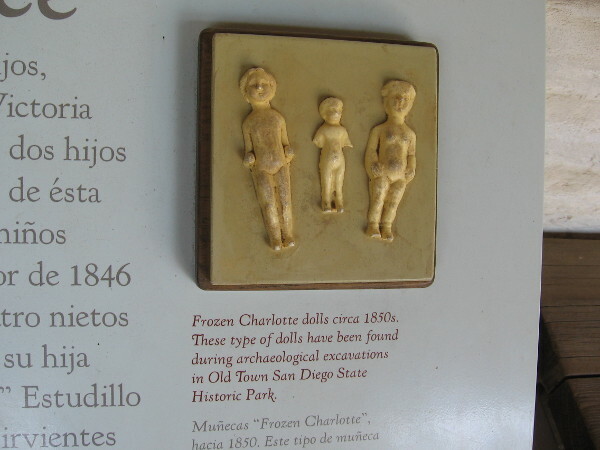 Posted on August 9, 2017 Tags buildings, california, cowboys, cows, historic homes, historic places, history, mexico, museums, old west, photo, ranches, san diego, tour5 Comments on History at the Los Peñasquitos adobe ranch house. 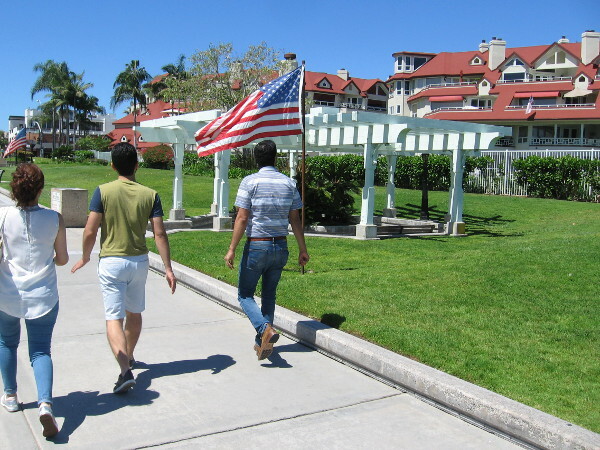 A colorful spring walk around Coronado. 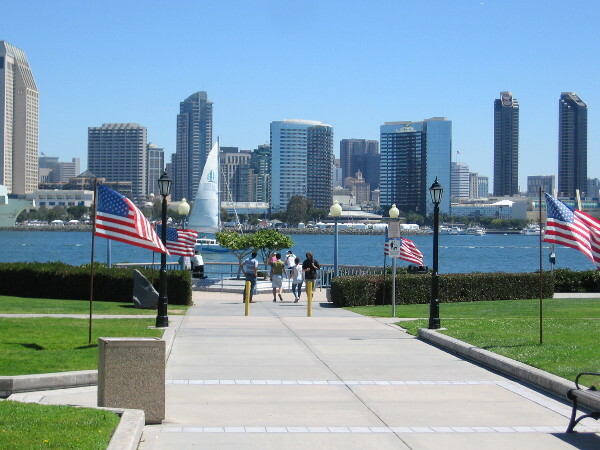 Looking across San Diego Bay toward downtown. 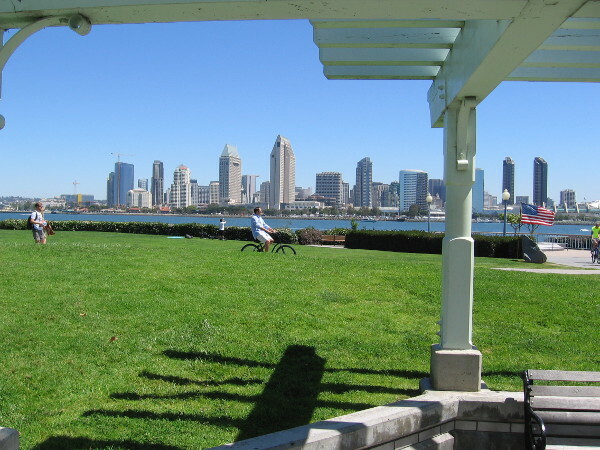 A spectacular view from Coronado’s beautiful Centennial Park. Spring will soon become summer. I had to wear shorts for my long walk around Coronado today. A very warm sun was shining and the island was abloom. Walking west through Centennial Park. Flags line the pathway for the upcoming Memorial Day weekend. Gazing from a sheltered area with benches across the green grass. The skyline of downtown San Diego rises in the background. Words on one bench. 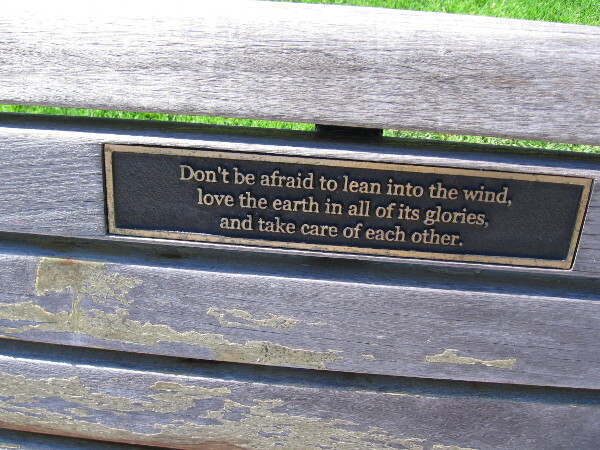 Don’t be afraid to lean into the wind, love the earth in all of its glories, and take care of each other. 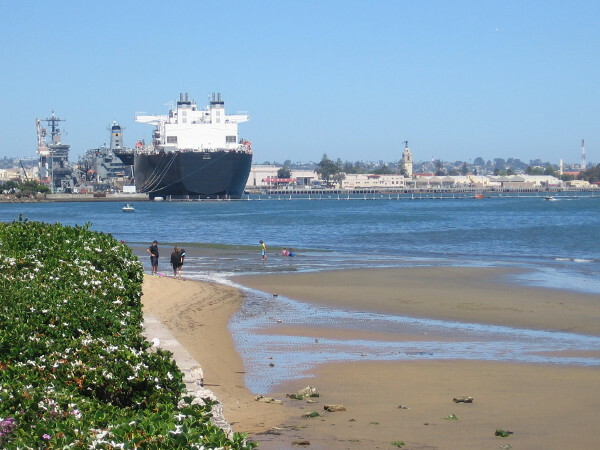 Gazing north along the bayside beach toward Navy ships docked at North Island. 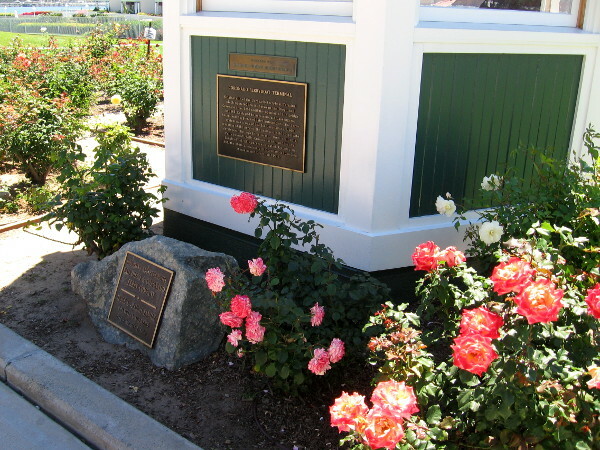 Roses bloom near the old ticket booth of the original Coronado ferry. 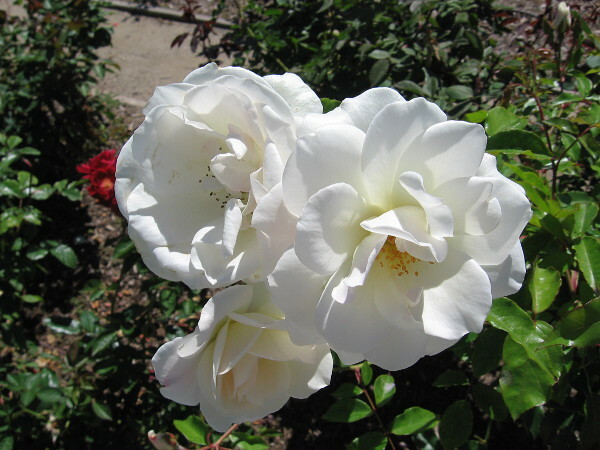 A spring bloom in Coronado. 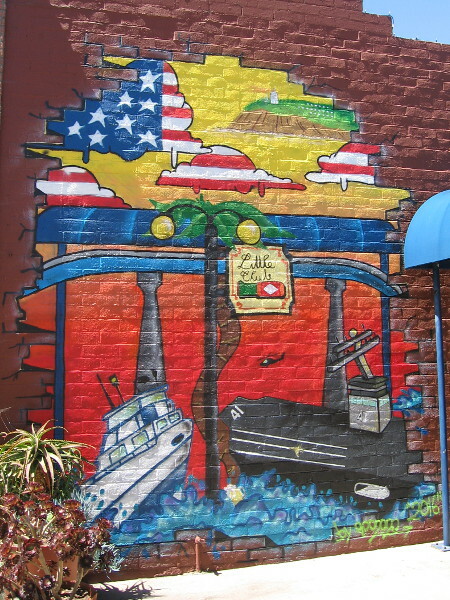 Some patriotic art on a wall by the Little Club on Orange Avenue. Walking west along Orange Avenue. 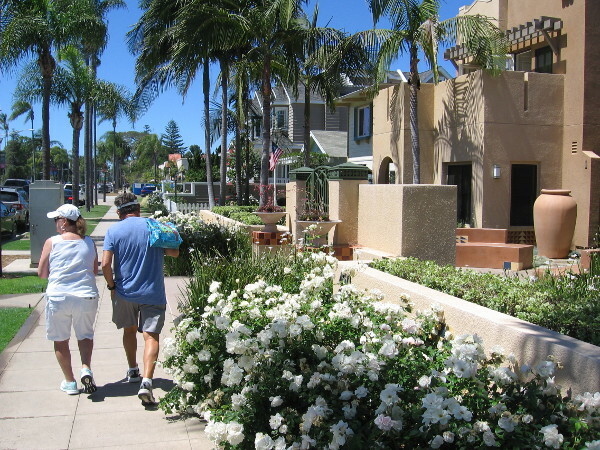 Coronado is pleasant, friendly and inviting wherever you roam. 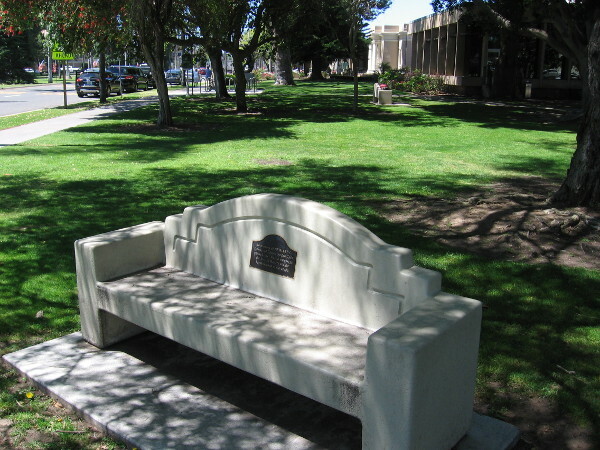 Bench near the front of the Coronado Public Library. 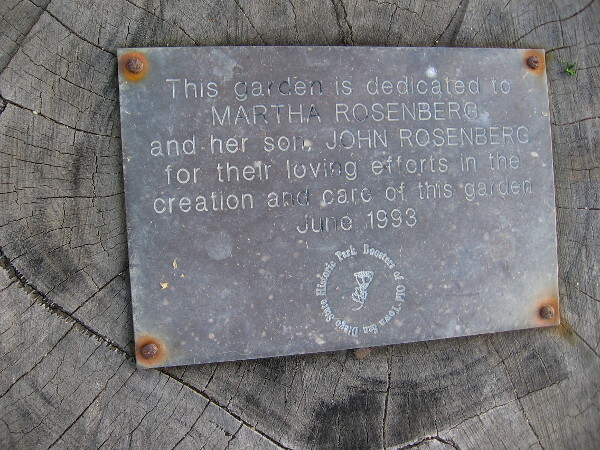 Plaque on the bench. 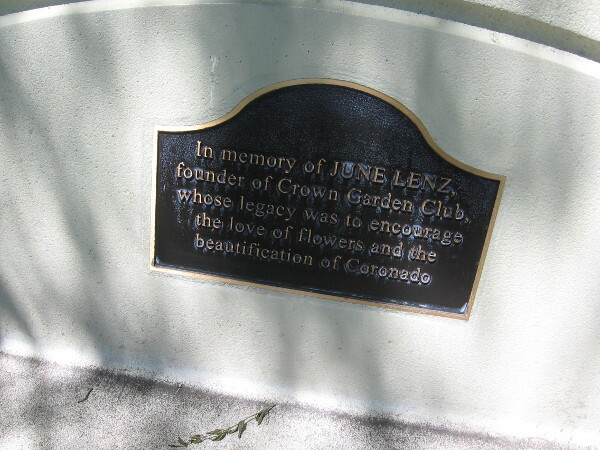 In memory of June Lenz, founder of Crown Garden Club, whose legacy was to encourage the love of flowers and the beautification of Coronado. 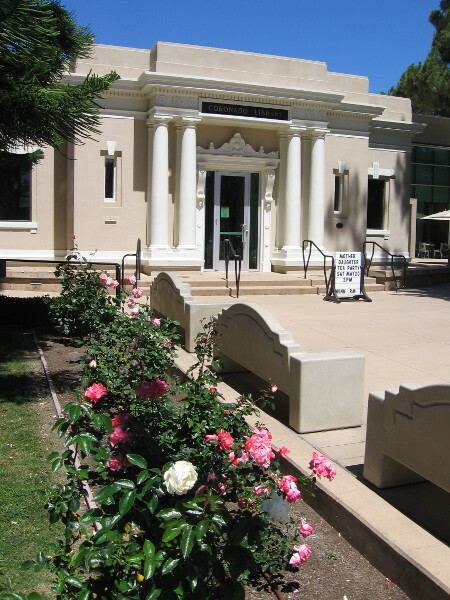 Flowers in front of the stately but welcoming Coronado Public Library. 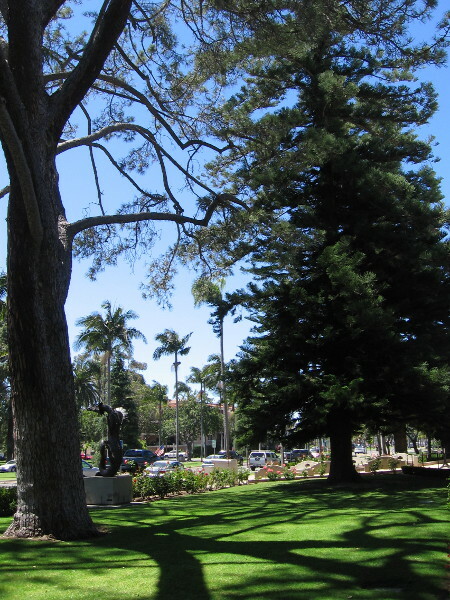 The big Torrey Pine on the left side of this photograph is a Coronado Heritage Tree. 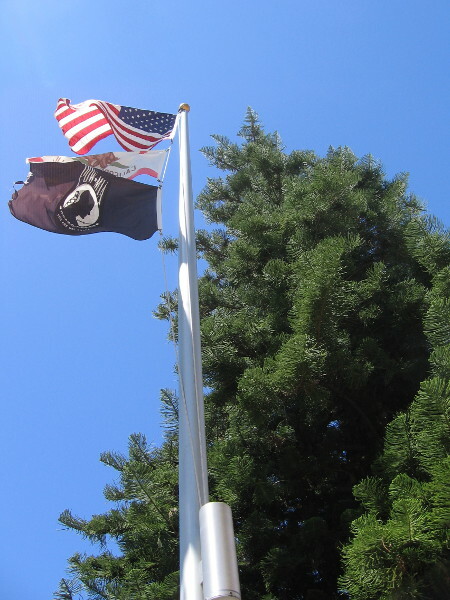 Flags by the library fly proudly on a spring day. A plaque on a boulder by the flagpole. The Stockdale Tribute. 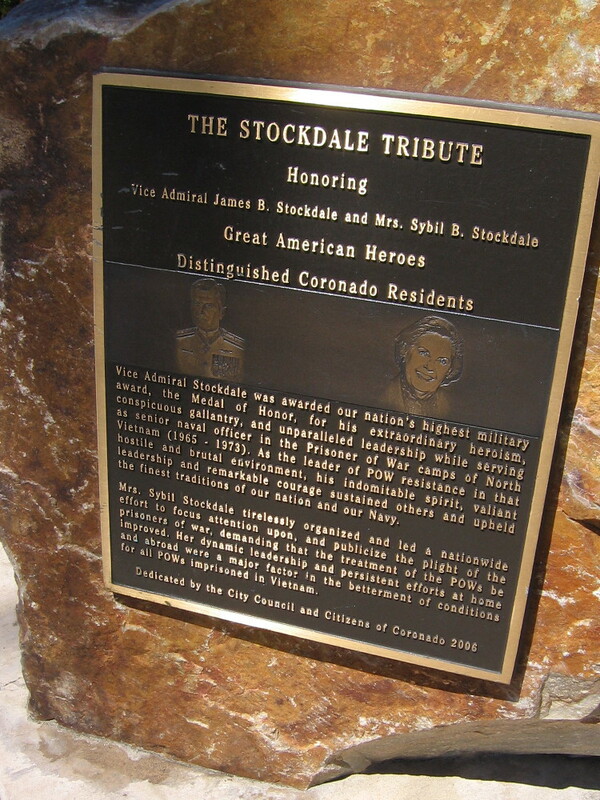 Vice Admiral Stockdale and his wife Sybil were distinguished Coronado residents. 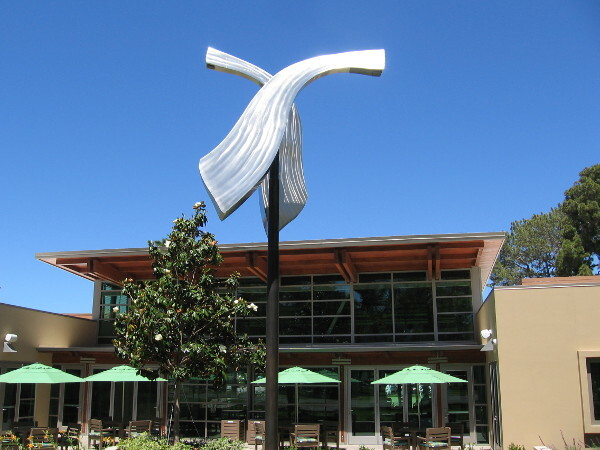 A shining, kinetic sculpture by the library turns in the breeze. A flower vendor brightens Orange Avenue. This life-size Marilyn Monroe by an Orange Avenue shop is in her iconic pose. 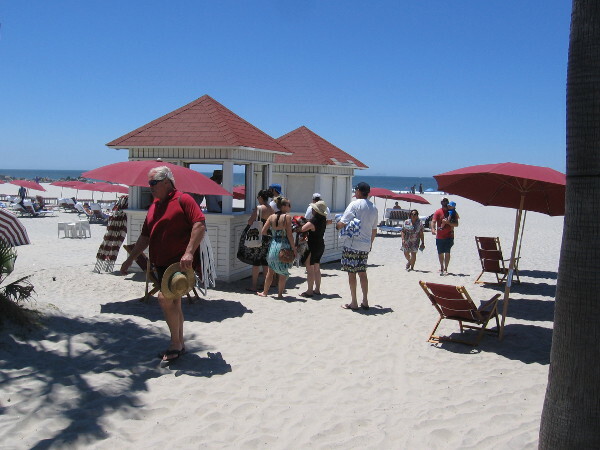 The famous actress starred in the movie Some Like It Hot, which was filmed at the nearby Hotel del Coronado. Flowers along fence of a pleasant house in affluent Coronado. Looking out across the wide beach toward the Point Loma peninsula and the Pacific Ocean. 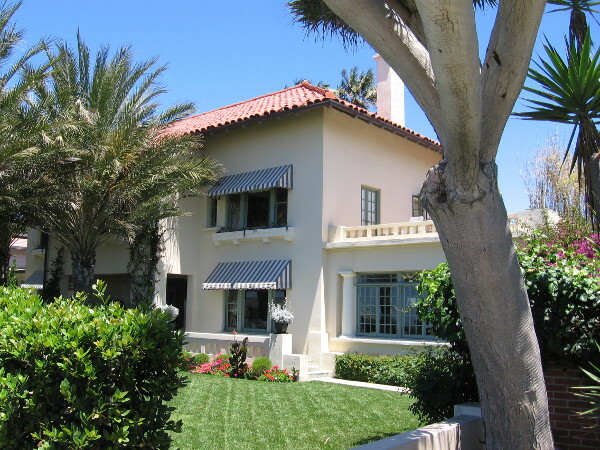 A peek at John D. Spreckels’ “beach house” on Coronado. On the beachfront, at 1043 Ocean Boulevard, you’ll find one of two historic Spreckels Mansions: his “beach house”. John D. Spreckels’ more impressive “bay-side house” is now the Glorietta Bay Inn, across from the Hotel del Coronado. 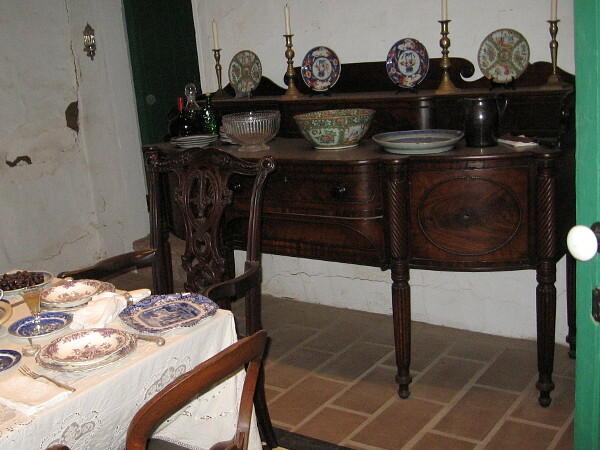 The successful and very wealthy businessman helped to transform San Diego into a bustling city and center of commerce. 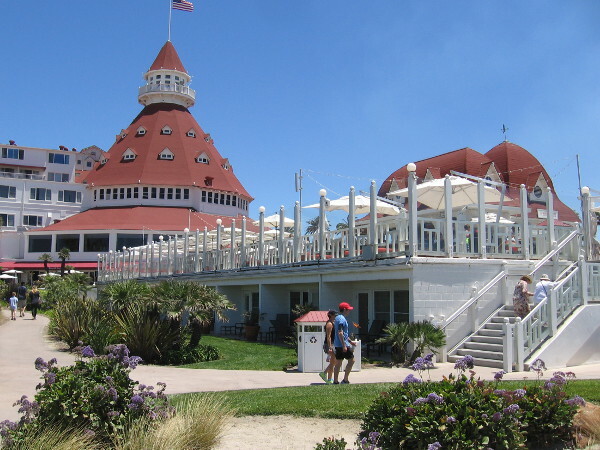 One of his business ventures included the world-famous Hotel del Coronado. 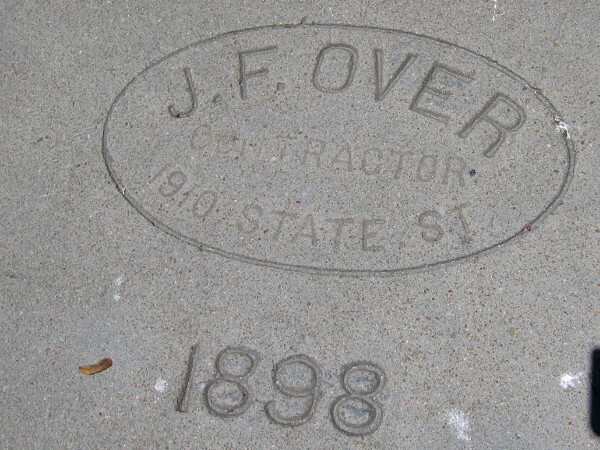 Concrete sidewalk in front of the Spreckels “beach house” is stamped 1898. 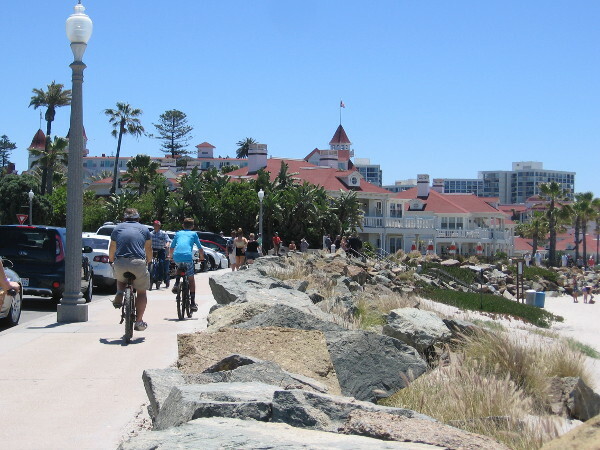 Heading south along the beach toward the Hotel del Coronado, one of the world’s finest resorts. 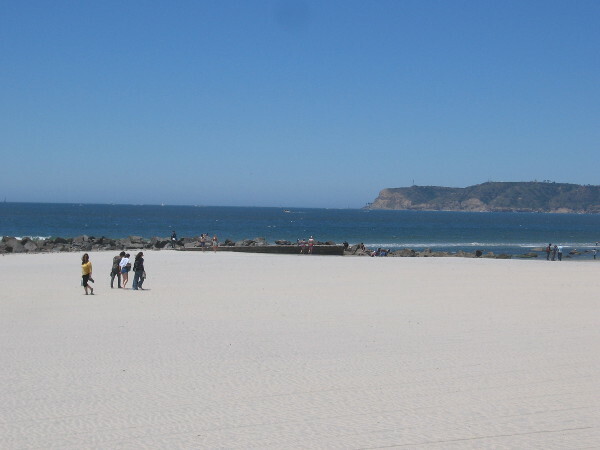 Coronado has one of the best beaches in the United States. It is regularly rated in the nation’s top five. 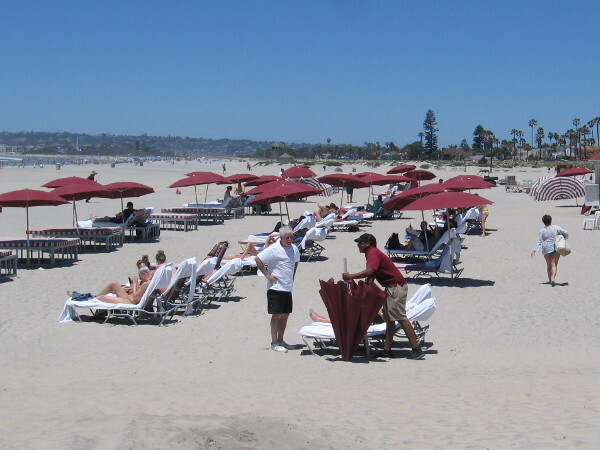 Hotel guests and visitors enjoy the San Diego sunshine on a broad white beach. 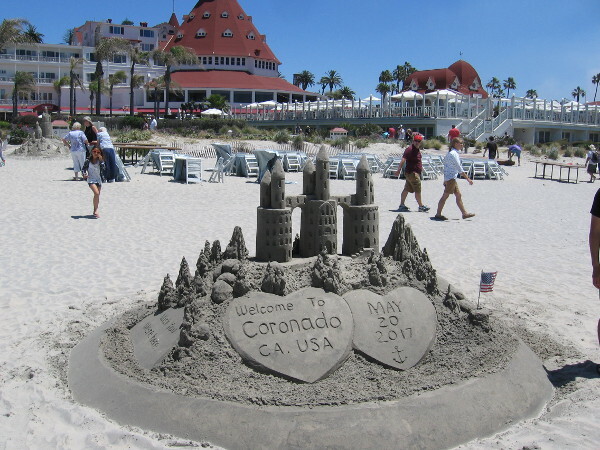 This cool sand sculpture was built near the Hotel del Coronado by The Sandcastle Man! The Hotel del Coronado is an architectural gem. Numerous world leaders, dignitaries and celebrities have stayed at the resort over the years. Sign by the beach. 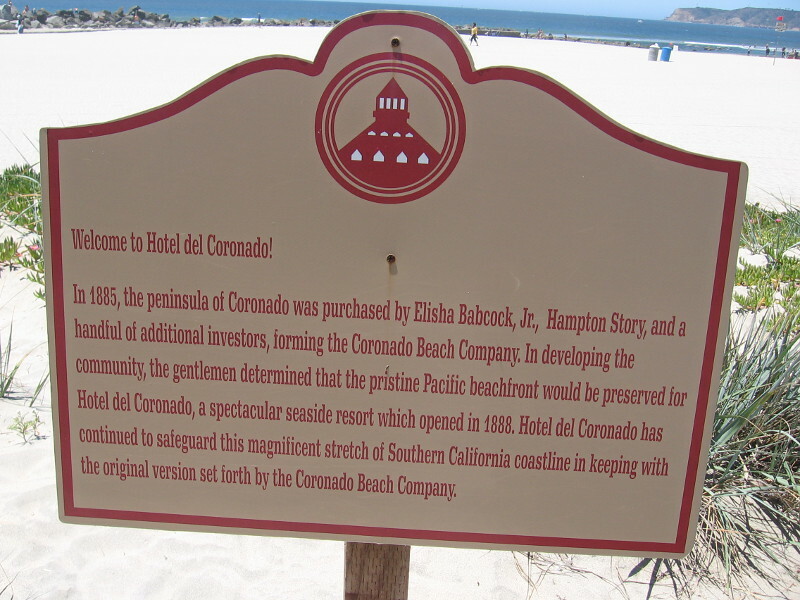 Hotel del Coronado continues to safeguard this magnificent stretch of Southern California coastline. 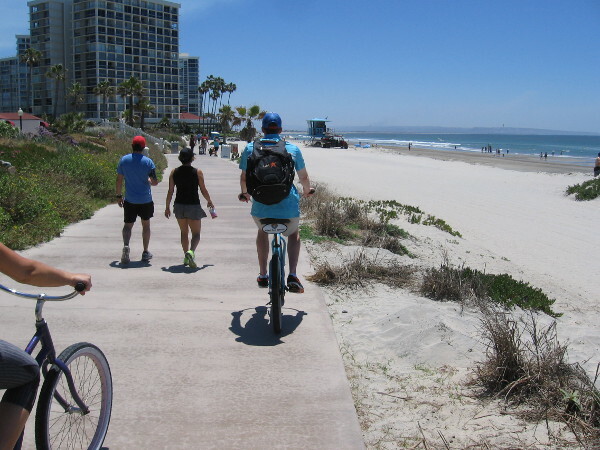 Biking down toward the Coronado Shores. 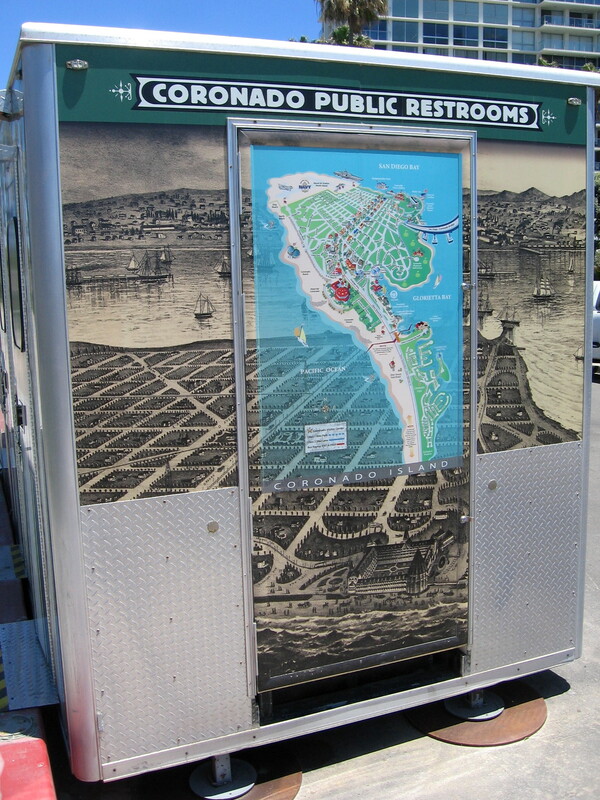 Old and new maps of Coronado Island on a portable restroom. 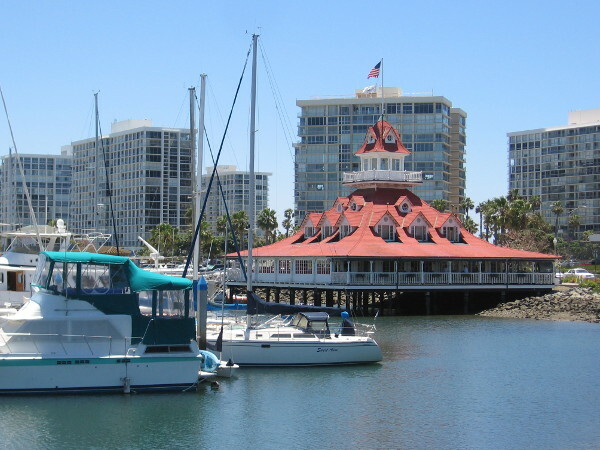 The Hotel del Coronado’s old boathouse, on Glorietta Bay, built in 1887. It’s now home to the Bluewater Boathouse Seafood Grill. 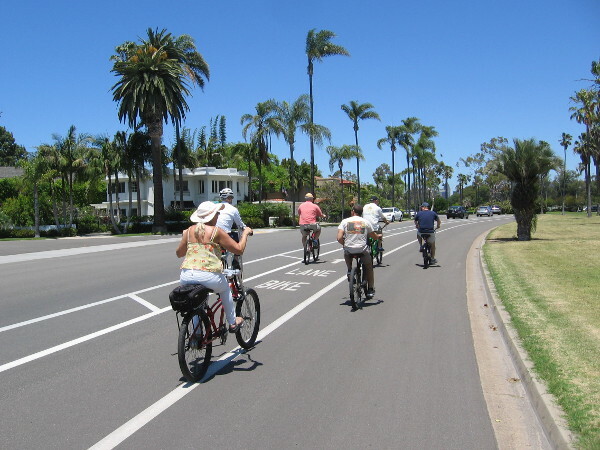 Bicyclists ride down Glorietta Boulevard, part of the Bayshore Bikeway around San Diego Bay. 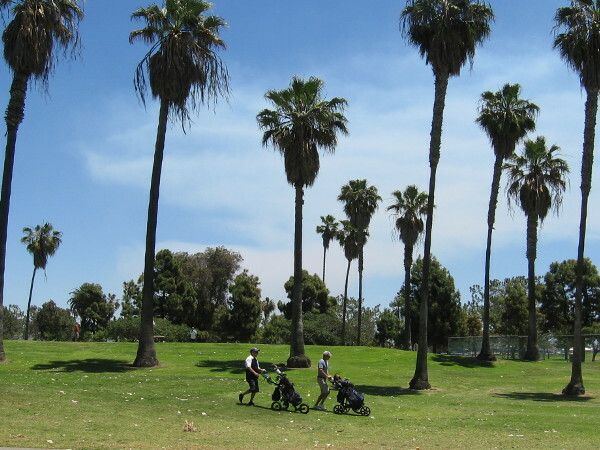 Golfers enjoy a sunny spring Saturday at the Coronado Municipal Golf Course. 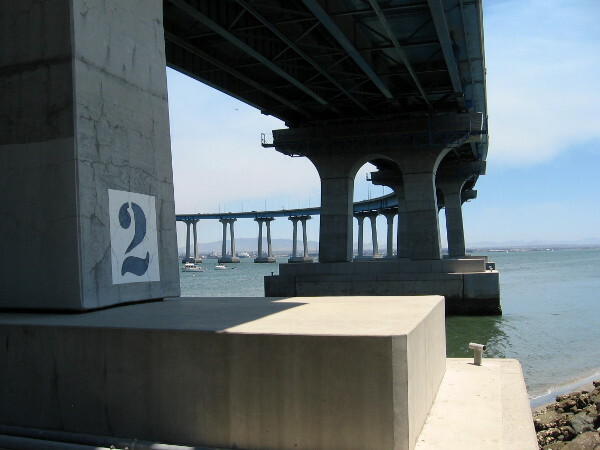 Photo taken beneath the San Diego-Coronado Bridge, which opened in 1969. Locals often call it the Coronado Bay Bridge. 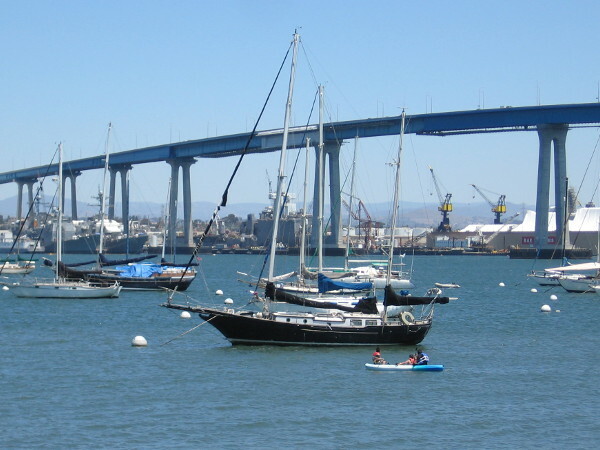 Boats moored between Coronado and the bridge. San Diego’s shipyards can be glimpsed on the other side of the bay. 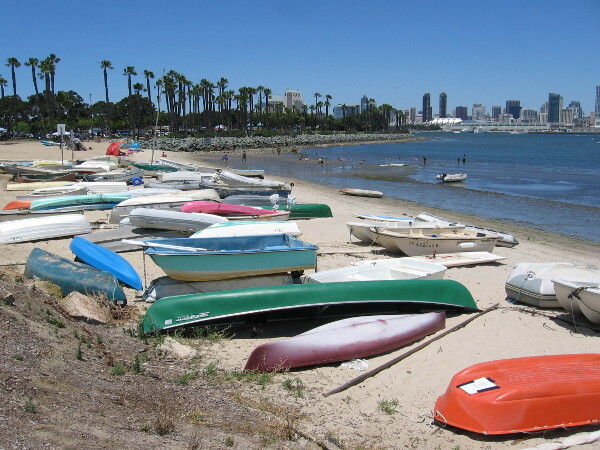 Colorful boats piled on the sand near Coronado Tidelands Park. 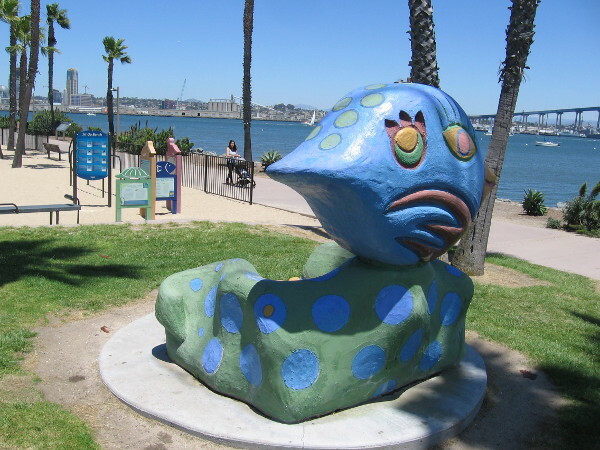 A silly bench by the playground at Coronado Tidelands Park, created by sculptor Douglas Snider of Studio 15 in Balboa Park’s Spanish Village Art Center. 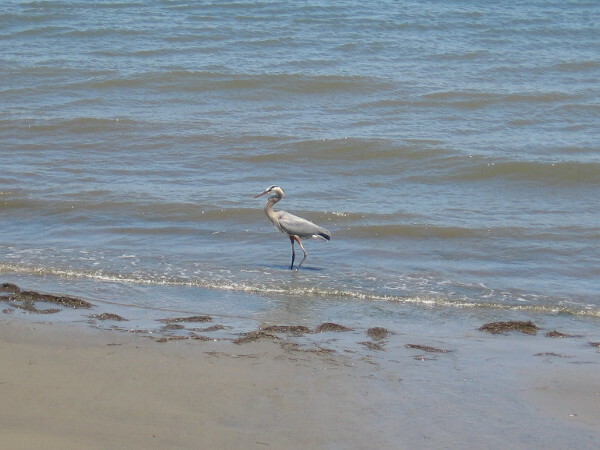 I believe this fellow down by the water is a great blue heron. My walk will soon come full circle. What a perfect late spring day. 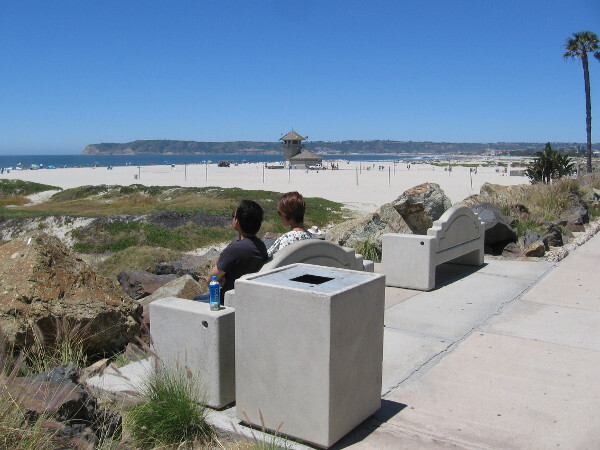 Posted on May 20, 2017 Tags beaches, coronado, coronado bridge, flowers, historic homes, hotel del coronado, libraries, parks, photography, plaques, public art, spring, sunshine, walking6 Comments on A colorful spring walk around Coronado.